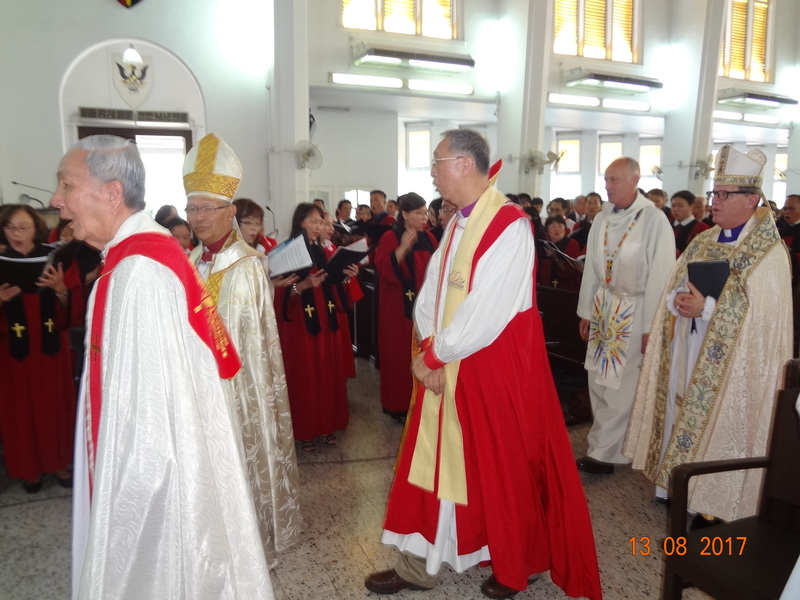 Ordained to the diaconate on 29th November 1992 and the Priesthood on 30th October 1993, the Rev. 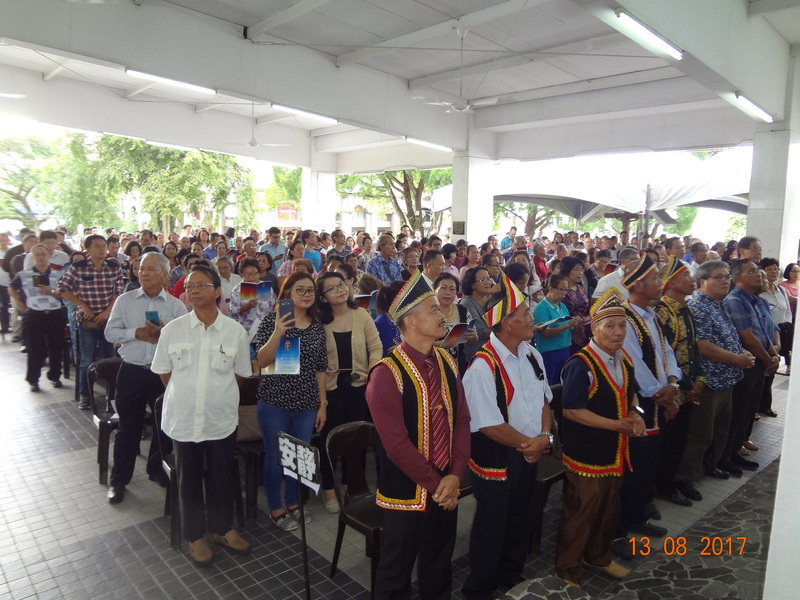 Danald Jute @ Donald Alvin Jute Aheng, 50 (born 24th November 1966) is of Sino-Bidayuh descent from Kampong Plaman Nyabet Serian. 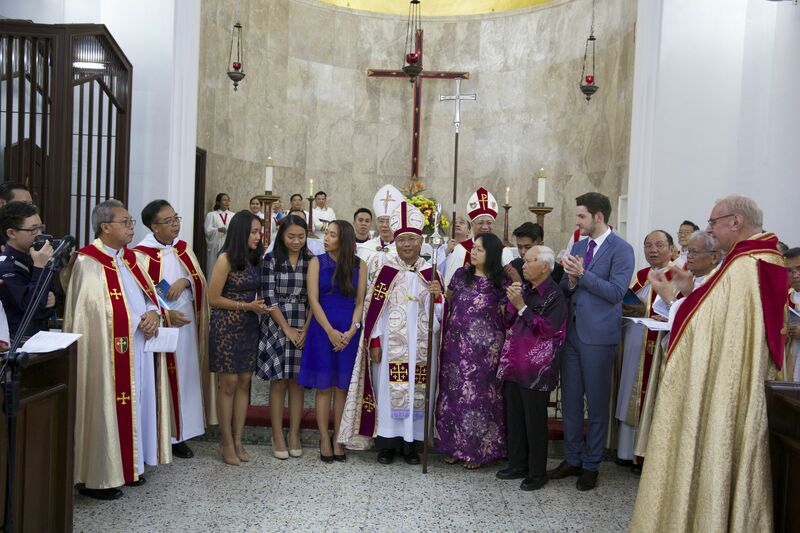 He is the seventh of eight siblings. 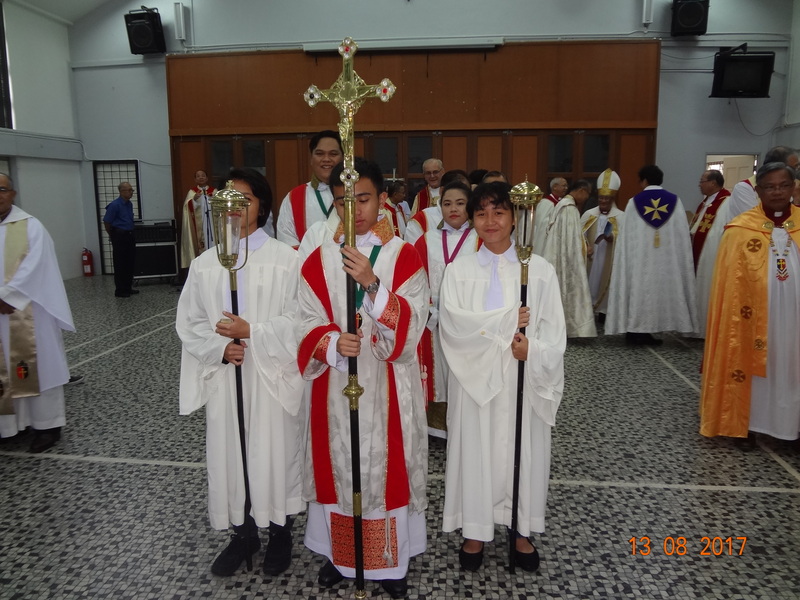 He came to know the Lord while in Confirmation Class at the age of 12. 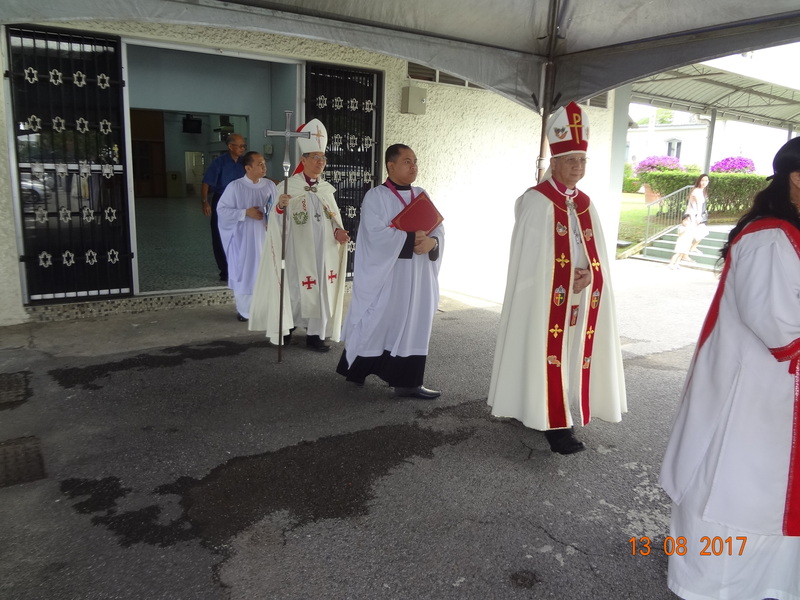 From thence, he was involved in Bible Study Groups and Youth Camps, organised by the Anglican Communications Centre (School Chaplaincy), Kuching . 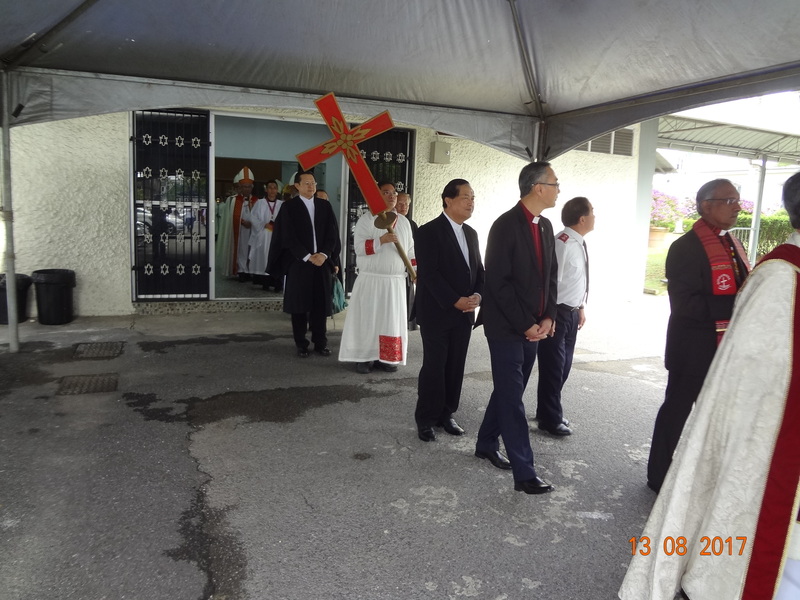 He served as head of the ISCF and Anglican Young People’s Associations in Kolej Tun Razak, Kuching, and would regularly accompany the then School Chaplain, the Rev. 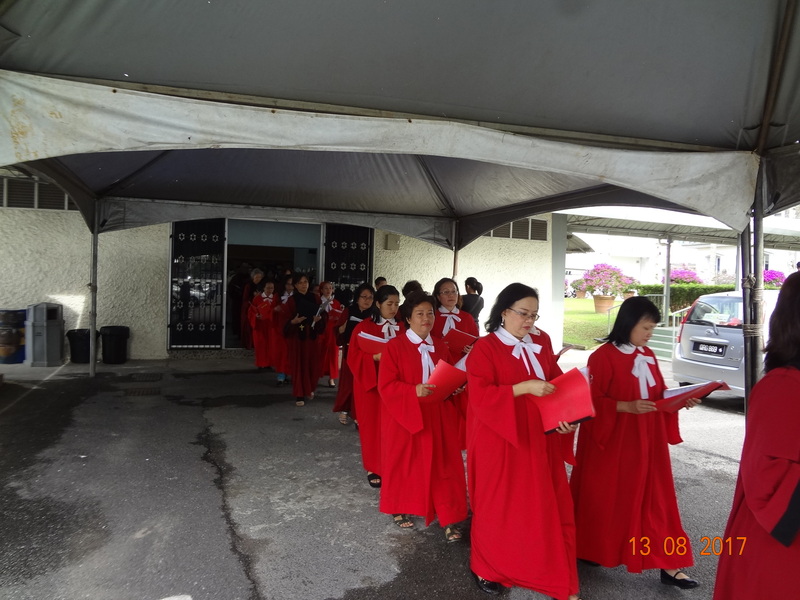 Aeries Sumping (now Asst. 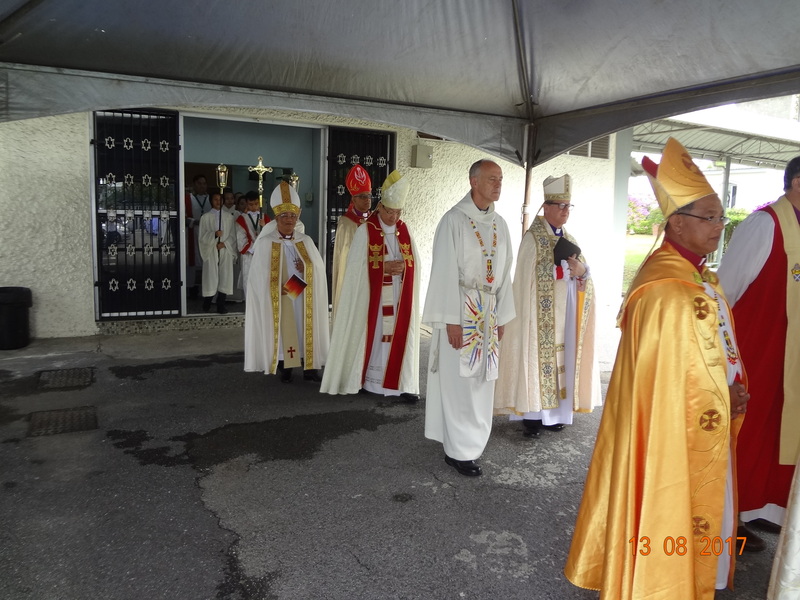 Bishop) on his visits to the various schools. 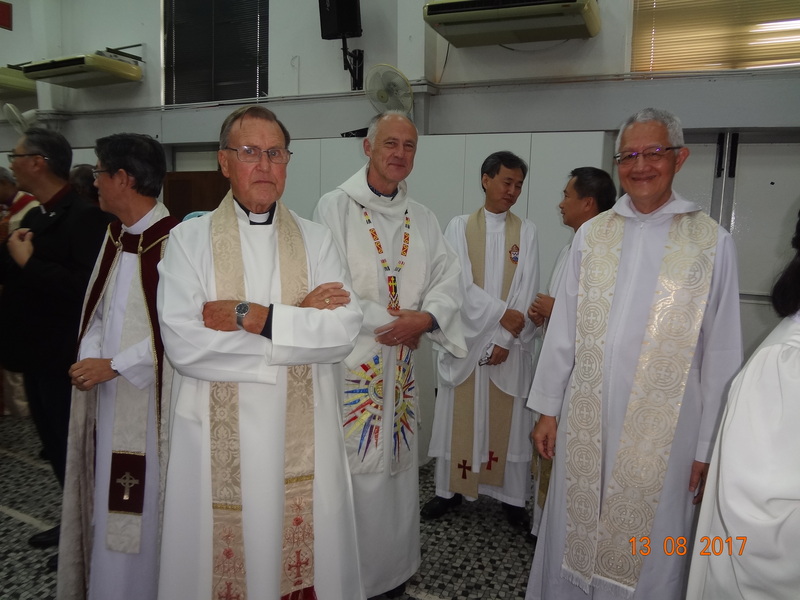 Sensing the Lord’s call to full-time ministry, he went on to test his vocation in 1984 and trained at the House of Epiphany, Kuching. 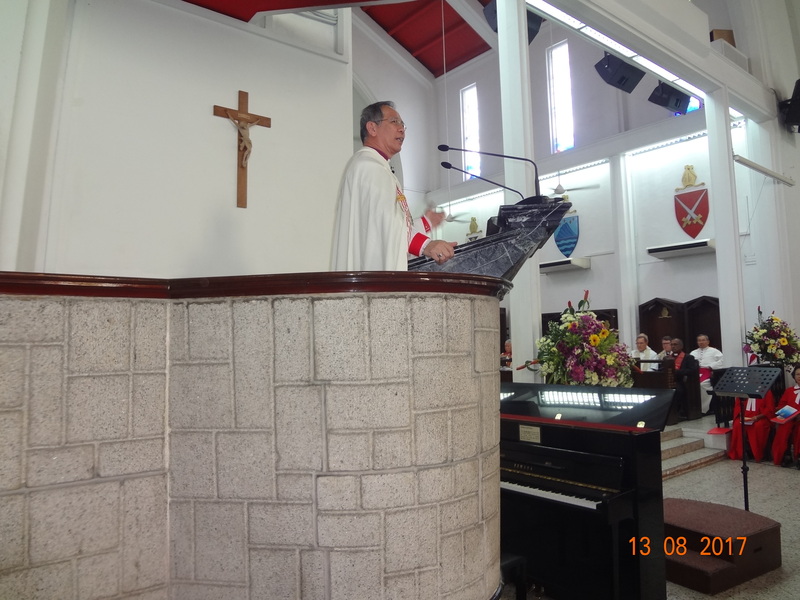 In 1989 – 1992 and 2002 – 2009, he was in the UK, studying at the University of Edinburgh and serving the Church in Scotland. 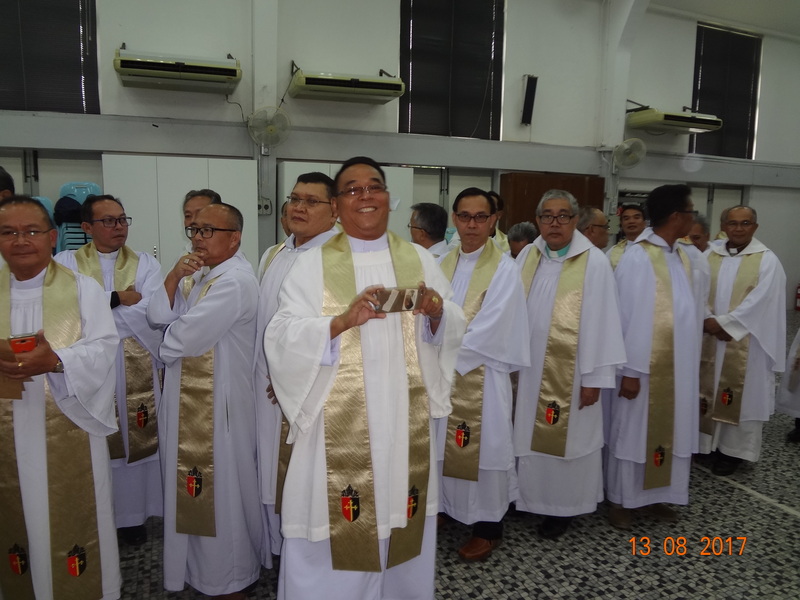 He believes that a priest, a bishop is called and entrusted by the Lord to feed, nurture, and lead His people while at the same time reaching out to others with the life-changing Gospel of the Lord Jesus Christ. 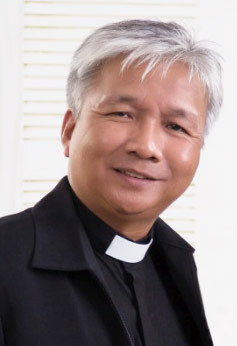 Among others, he is passionate about Church Renewal, Relevance of Worship, Discipleship training, Youth Ministry and the Empowerment of Lay Leadership. 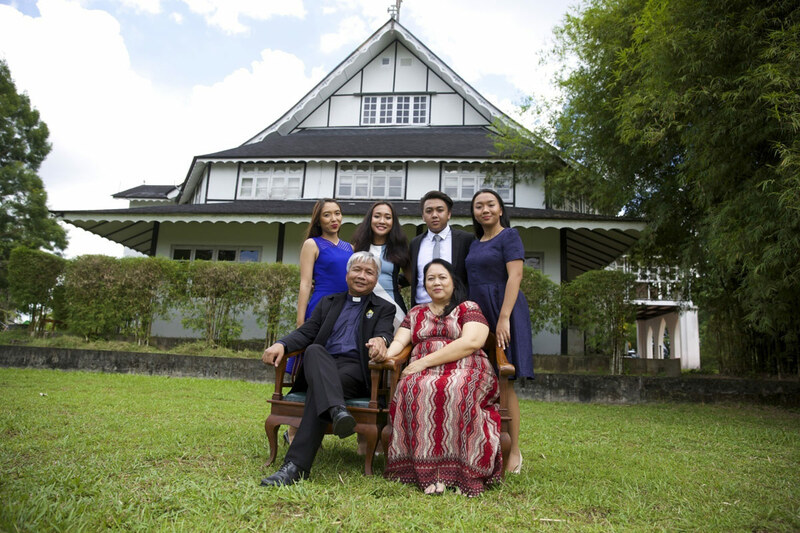 He is married to Julita Jack and they have four grown up children – Izra Christabelle, Iona Moira, Ian Isaiah and Ingrid Sarah. 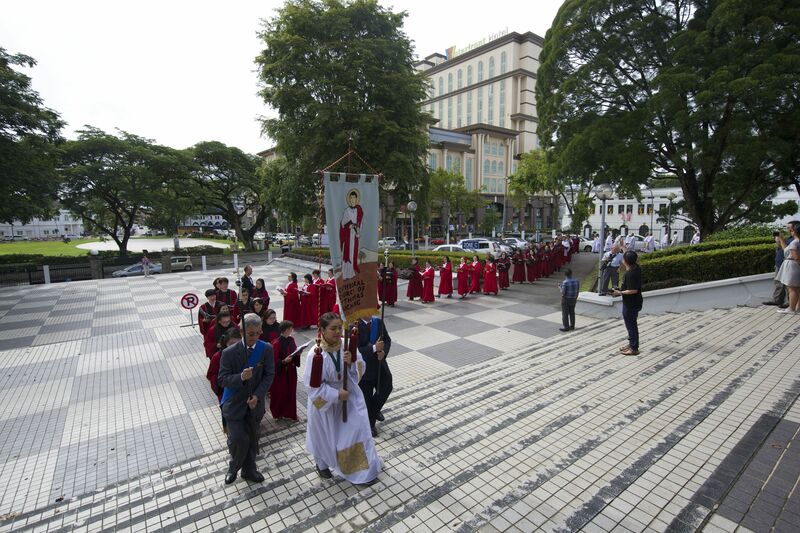 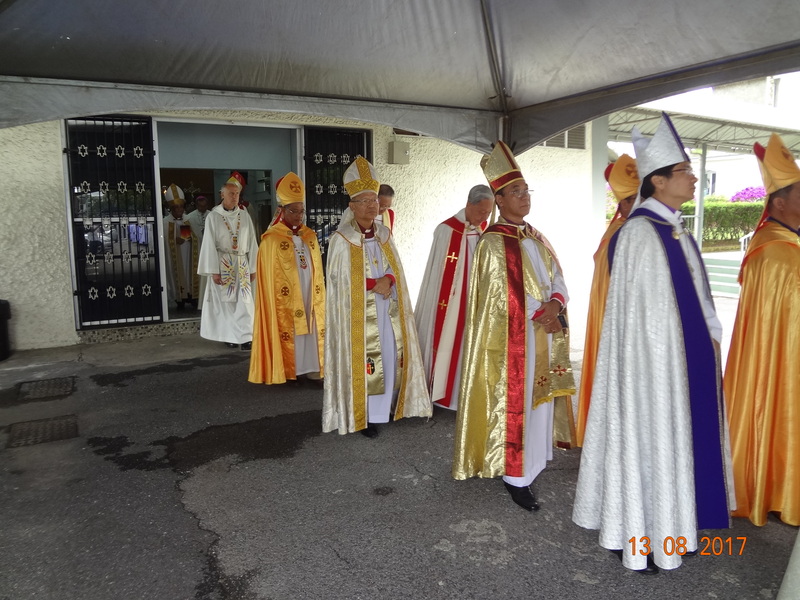 The Consecration and Enthronement of the 14th Bishop of Sarawak and Brunei was held at the St. Thomas’s Cathedral Kuching on 13th August 2017 at 4PM. 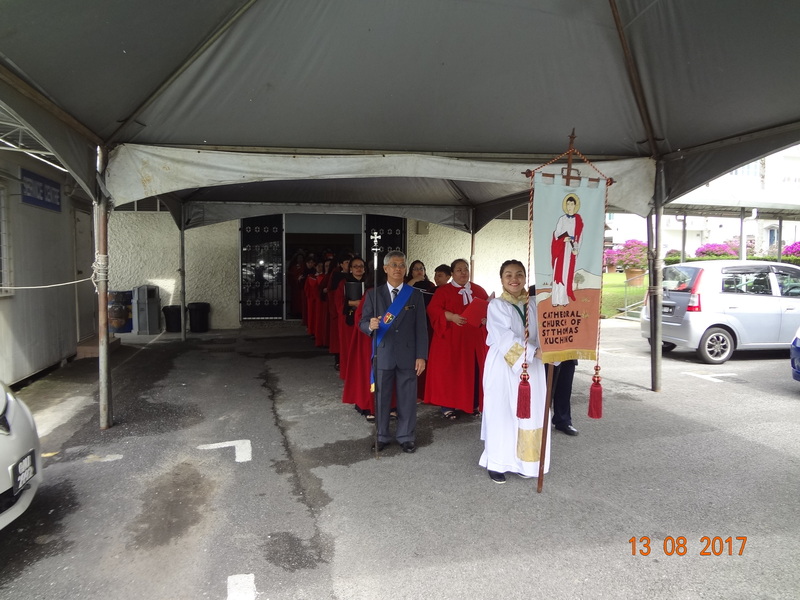 The procession started from the Parish Hall with processional hymns “Crown Him with Many Crowns” and “All Hail the Power of Jesus’ Name” into the main entrance of the Cathedral before the start of the Consecration service. 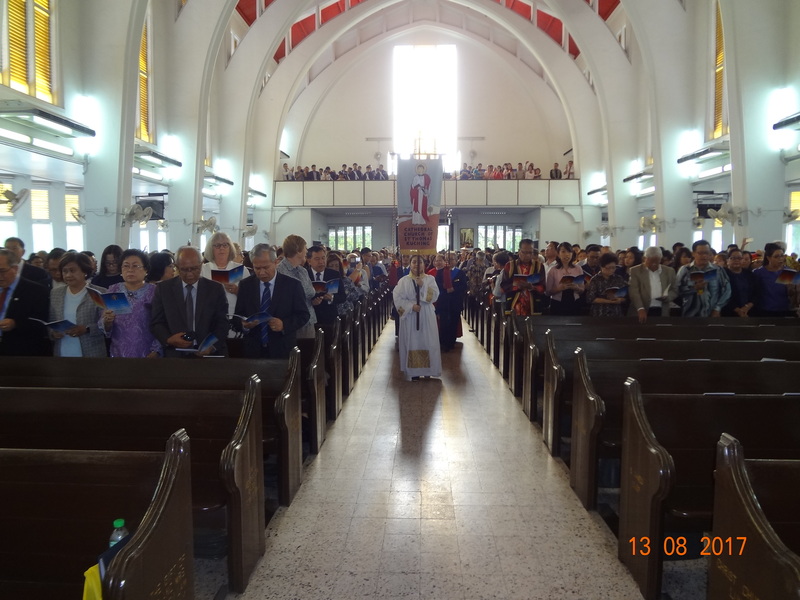 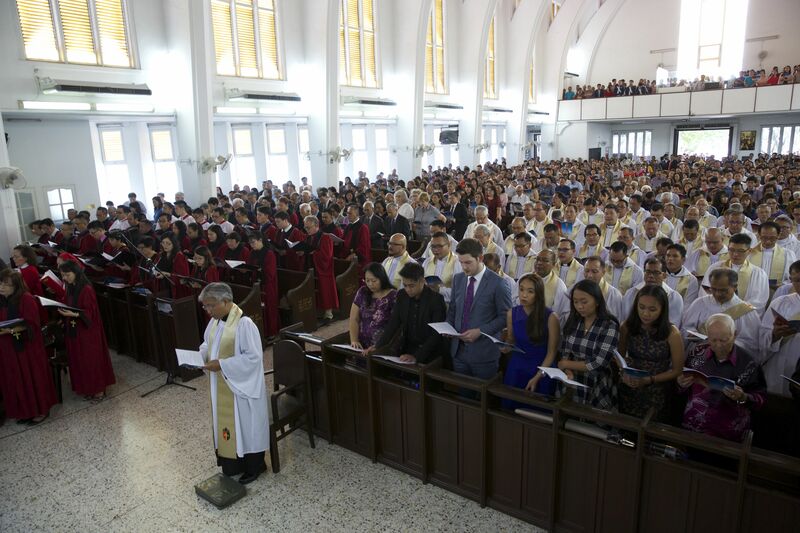 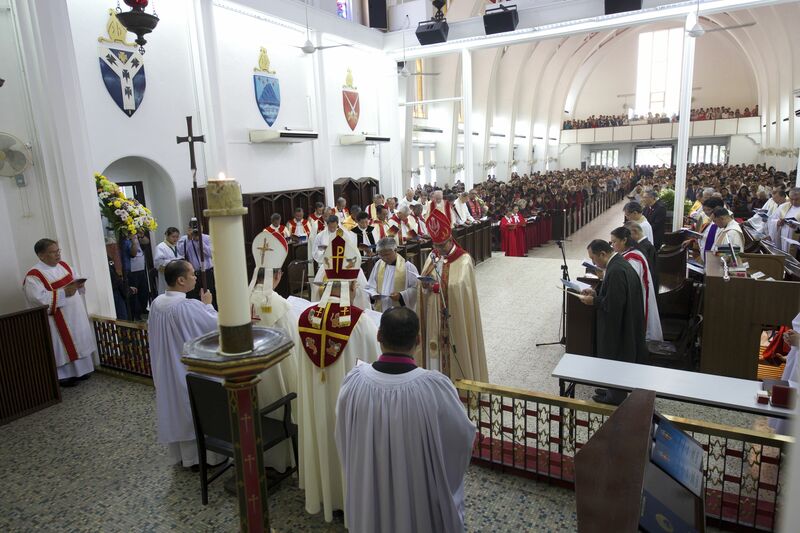 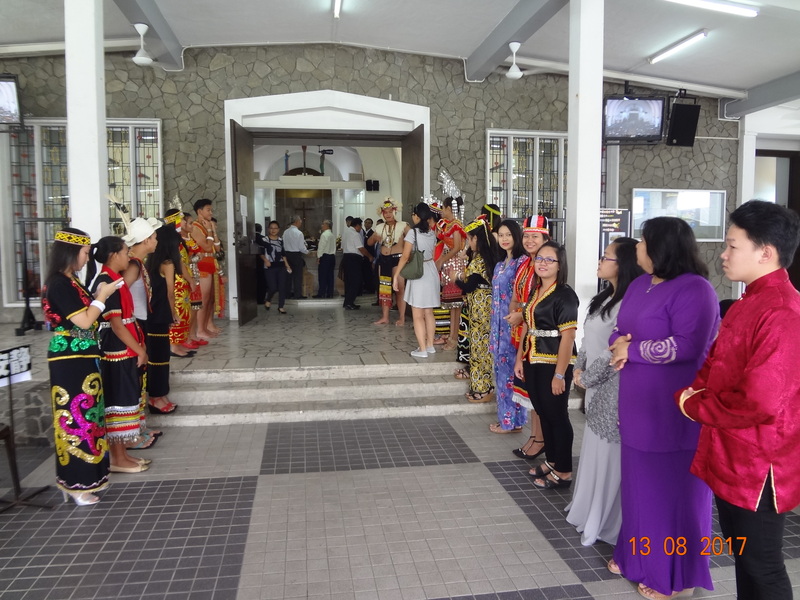 Over two thousand parishioners including invited guests from Hong Kong, United Kingdom, Philippines, Myanmar, the United States, Singapore, Peninsular Malaysia, Sabah, Labuan and Brunei were present to witness the Consecration Service. 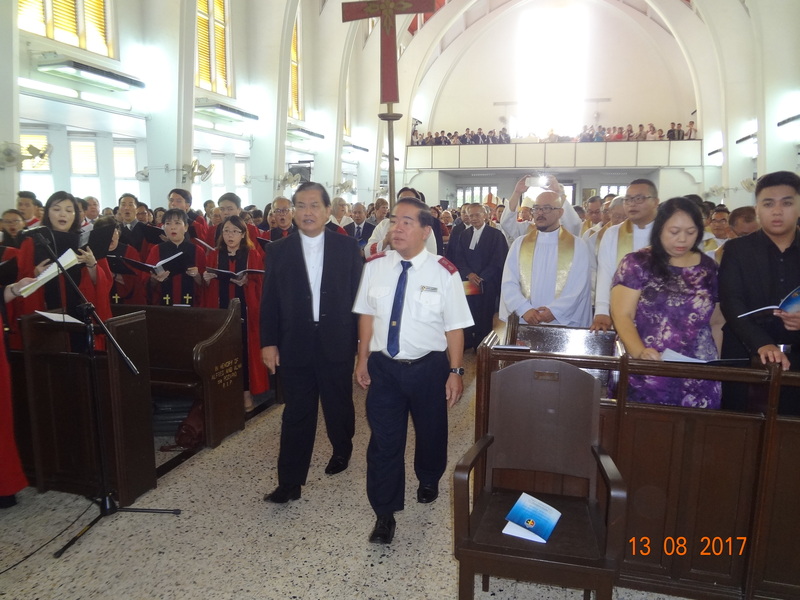 There were also representatives from the Roman Catholic Church, the Methodist Church, Borneo Evangelical Church, Seventh Day Adventist and Salvation Army. 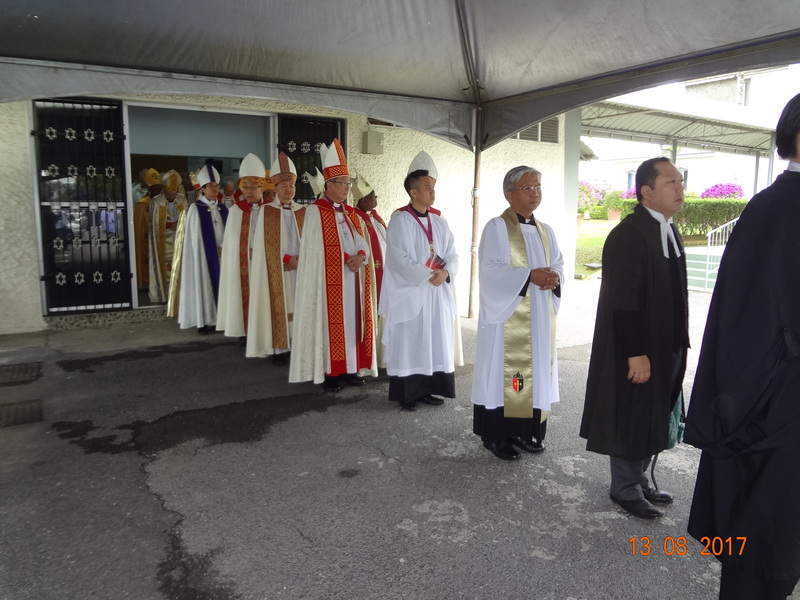 The Archbishop of the Anglican Provinces of South East Asia and Bishop of West Malaysia, the Most Rev’d Datuk Ng Moon Hing was the chief consecrator and preacher during the service. 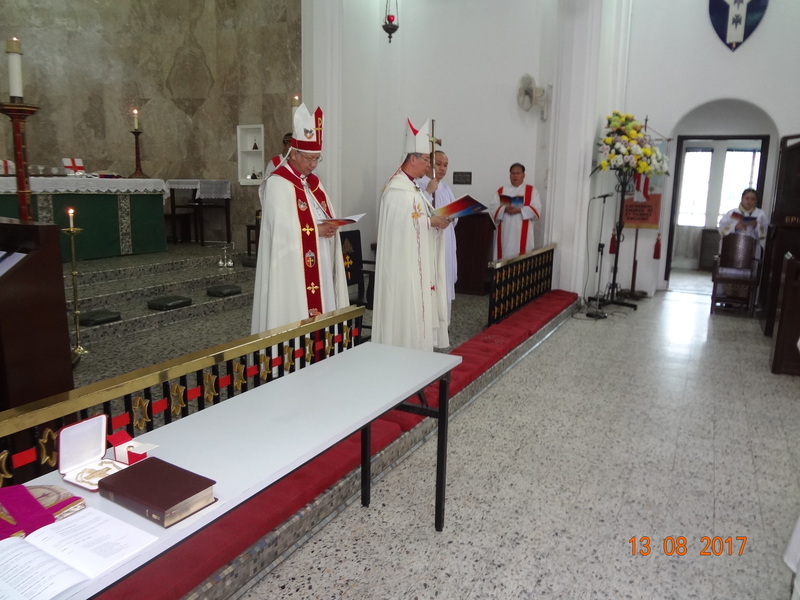 The Service started with a welcome by the Vicar-General the Rt. 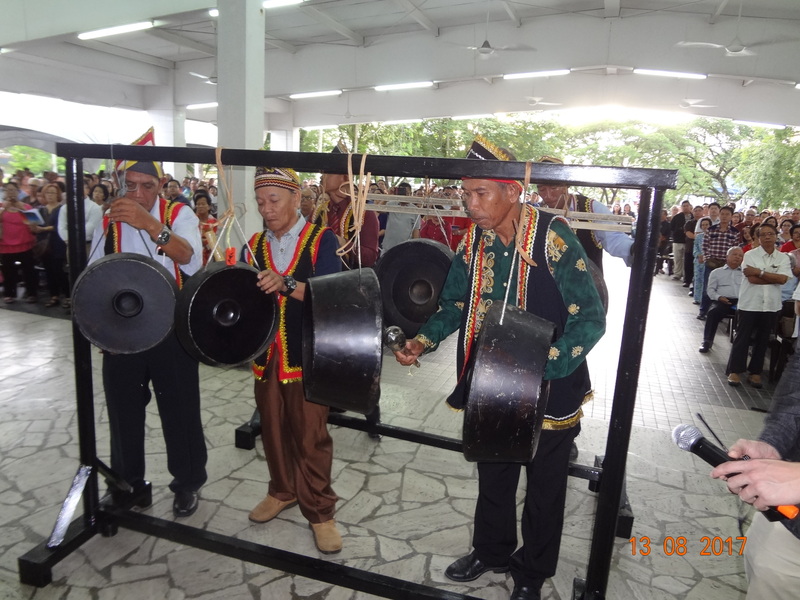 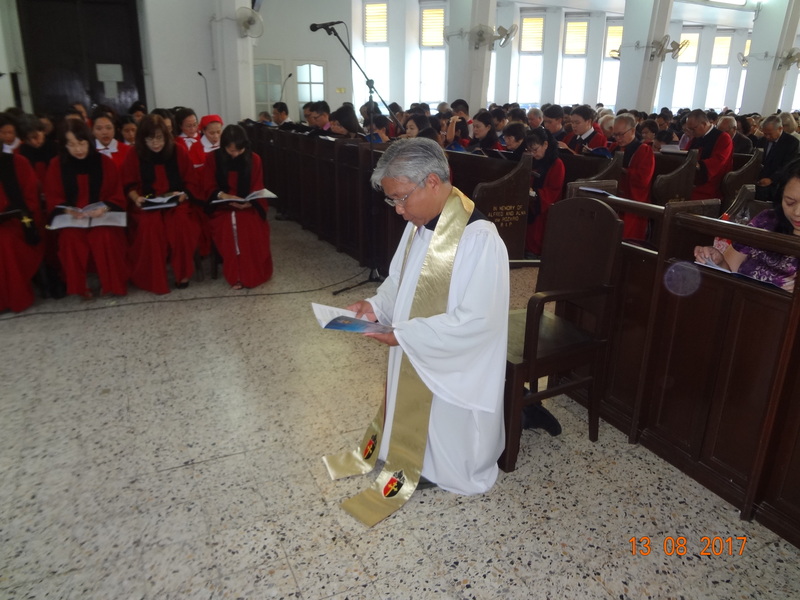 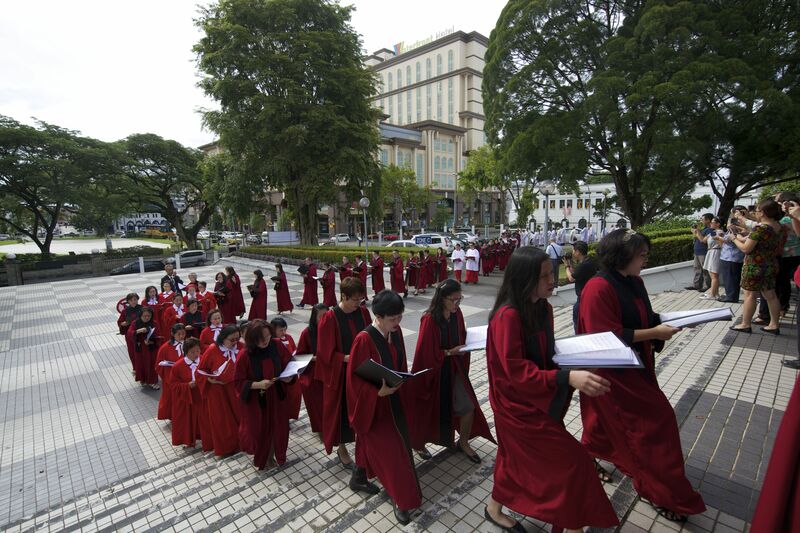 Rev’d Aeries Sumping Jingan before the “Collect of Purity” and “Prayer of Penitence” were recited. 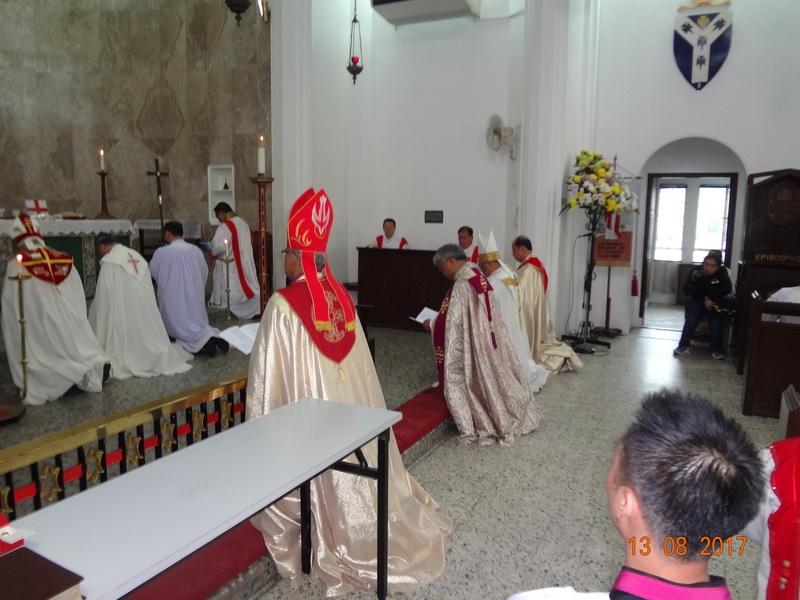 The Archbishop, the Most Rev’d Datuk Ng then proceeded with the Liturgy Service. 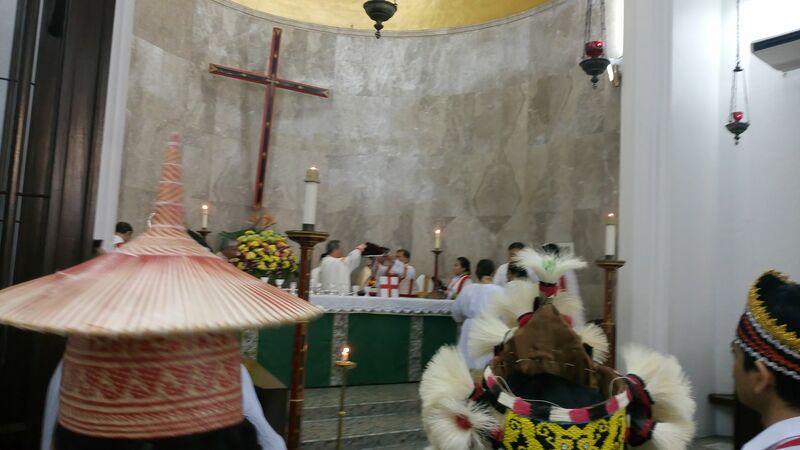 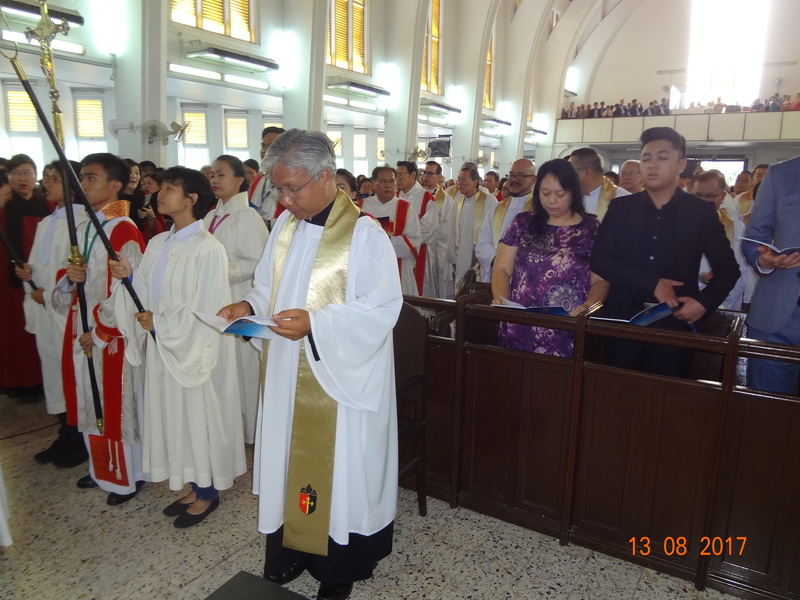 Collect for Consecration of a Bishop was recited by the Vicar-General before the Old Testament reading on Numbers 27: 15-20, 22,23 by Archdeacon Nelson Ugas Bulang in Iban and the New Testament reading on 2 Corinthians 4: 1-10 by Rev’d Kho Thong Meng in Mandarin . 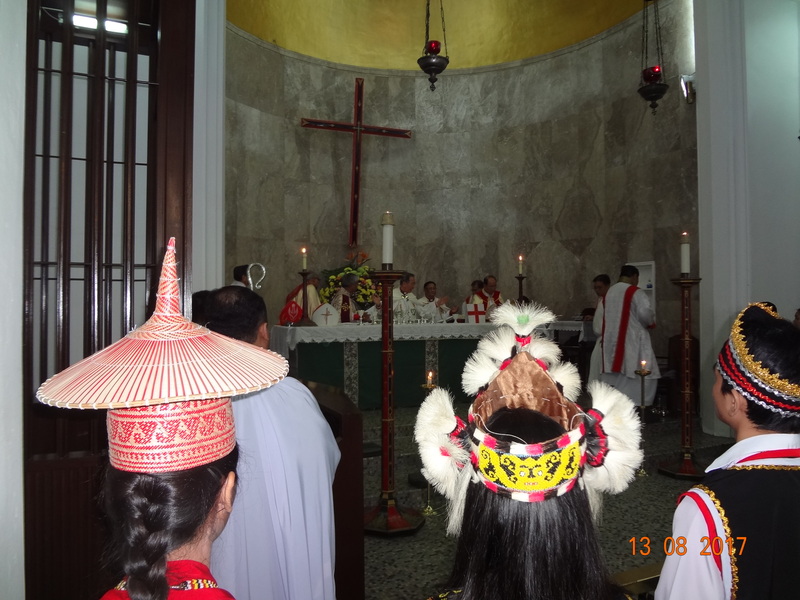 Gradual Hymn “O Tuhan Pimpinlah Langkah Ku” was sung. 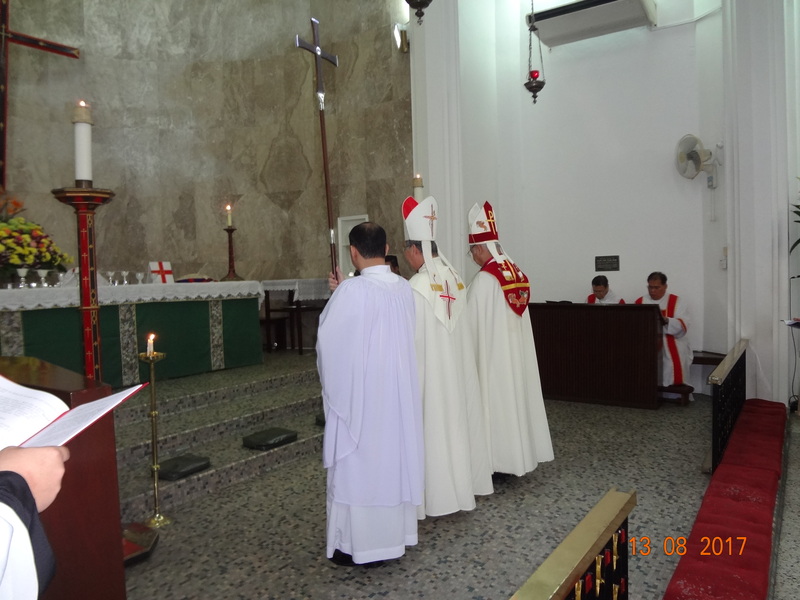 This was followed by the Gospel Reading on John 21: 15-17 by Archdeacon Andrew Pahah in Bukar before the Archbishop began with his preaching on the Gospel. 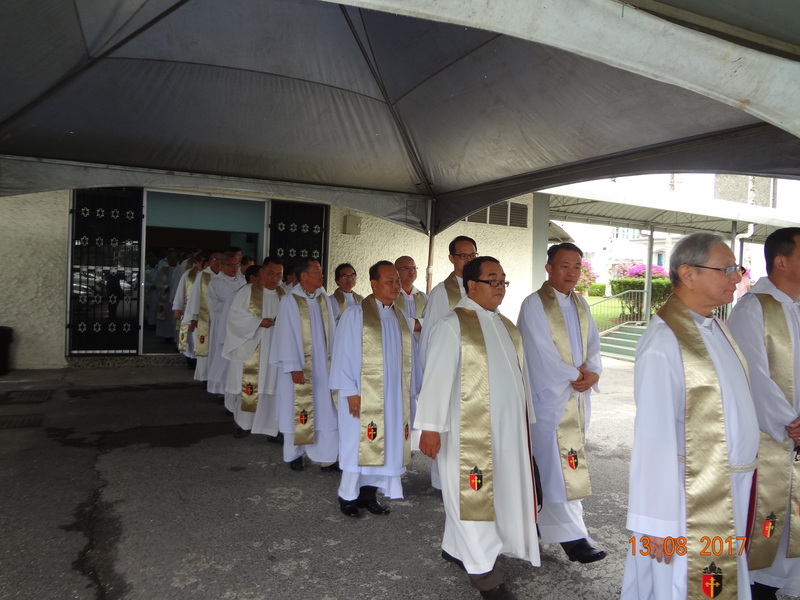 In his sermon to the congregation, His Grace said his Province was in dire need of more clergymen to serve the people as about 80% of them will retire in a few years time. 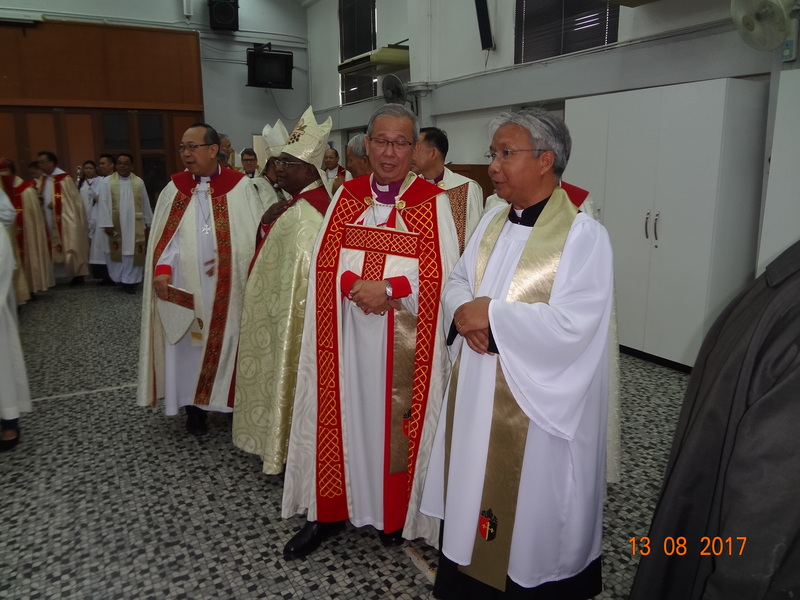 Before the presentation of Bishop-Designate Rev’d Danald Jute @ Donald Alvin Jute Aheng by the Bishop of Singapore, the Right Rev’d Rennis Ponniah , and the Bishop of Sabah, the Right Rev’d Melter Jiki Tais to the Archbishop the Most Rev’d Datuk Ng Moon Hing, a hymn “Be Thou My Vision” was sung. 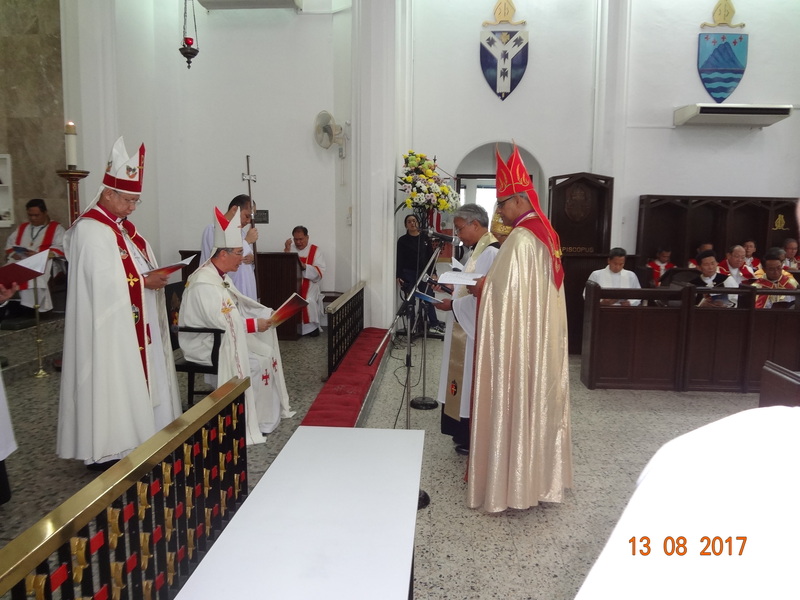 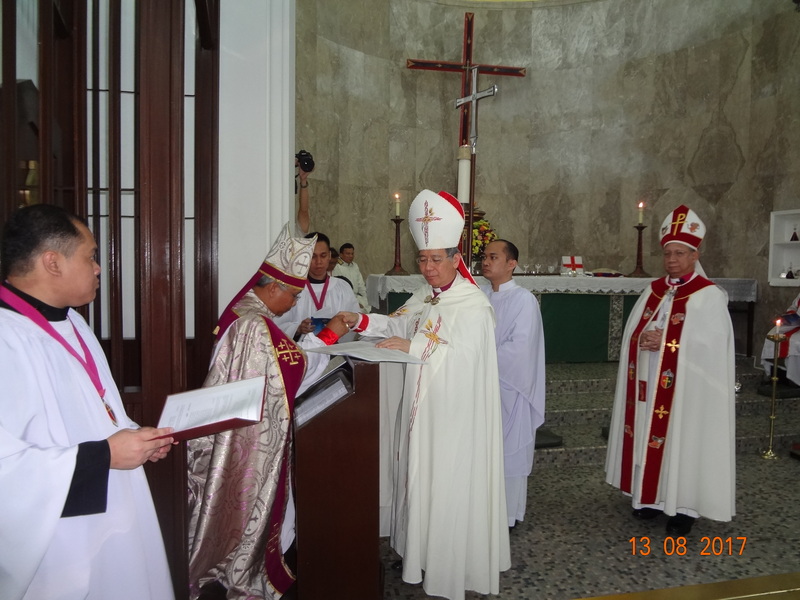 The Archbishop began the consecration process and the Provincial Chancellor read the Archbishop’s mandate. 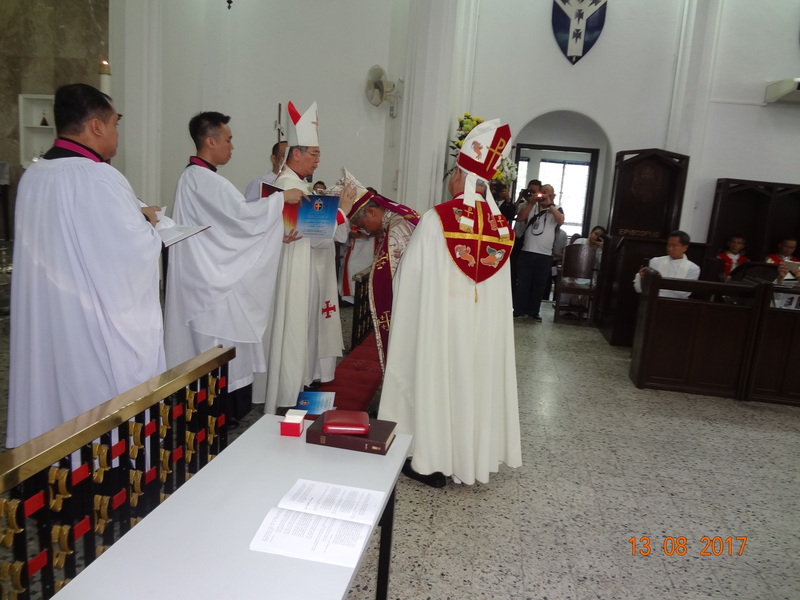 His Grace then presented the Bishop-Designate to the people. 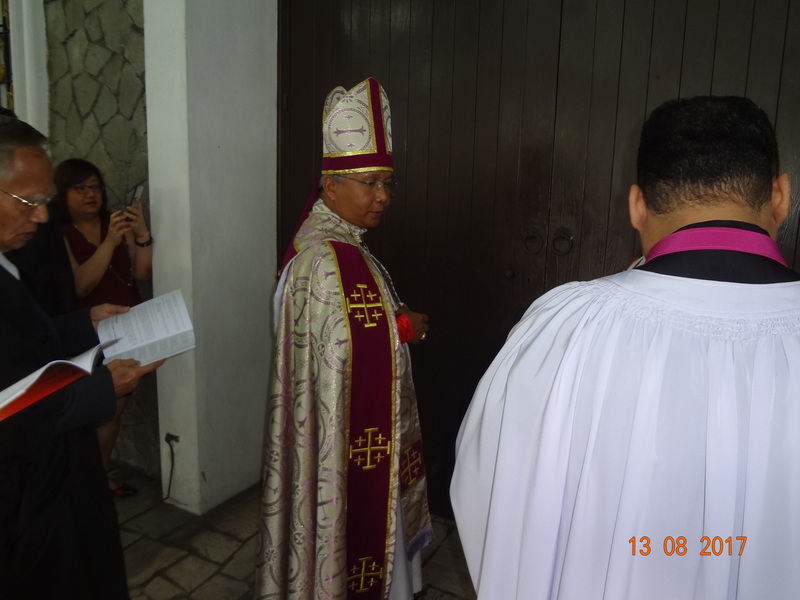 The Vicar-General read out the Preface to the Declaration of Assent and the Bishop-Designate, Rev’d Danald anak Jute then read the Declaration of Assent. 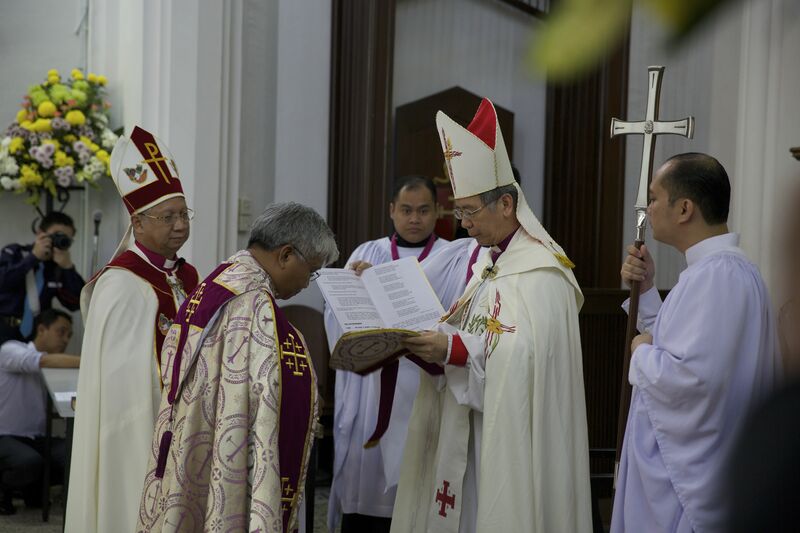 The Bishop-Designate stood before the Archbishop and His Grace then read out the Declaration and the Bishop-Designate will answer all. 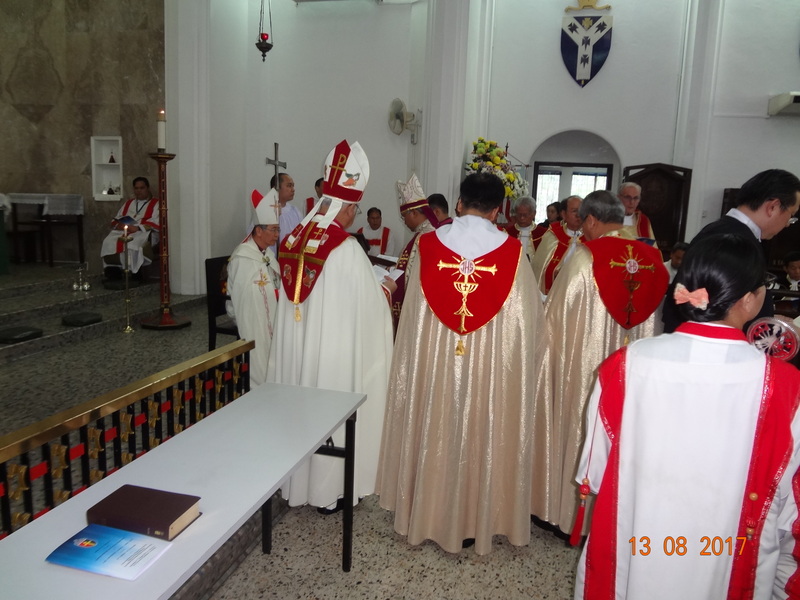 After the prayer by the Archbishop, the Bishop-Designate followed the Dean, the Very Rev’d Michael Buma, to the Vestry where he would be vested in the Episcopal Habit by the Presenting Bishops. 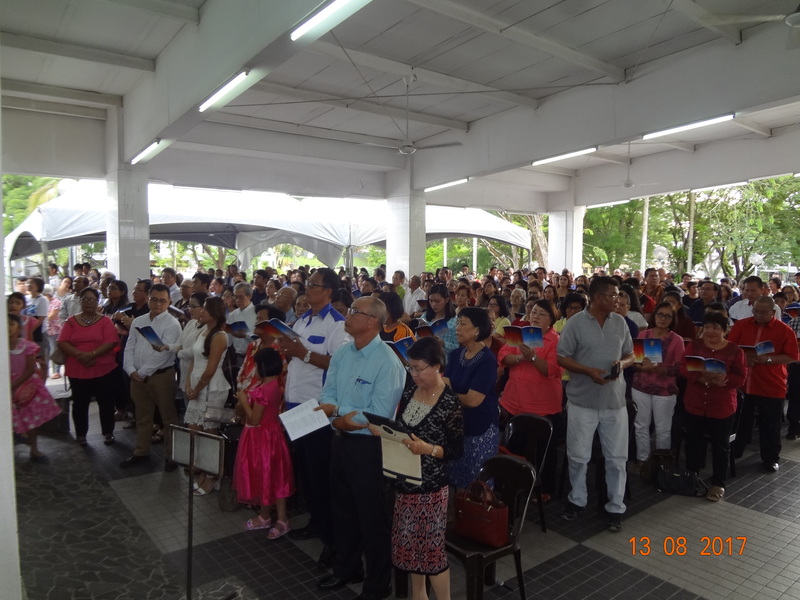 During vesting, the congregation stood and sang the Hymn “Here I Am, Lord”. 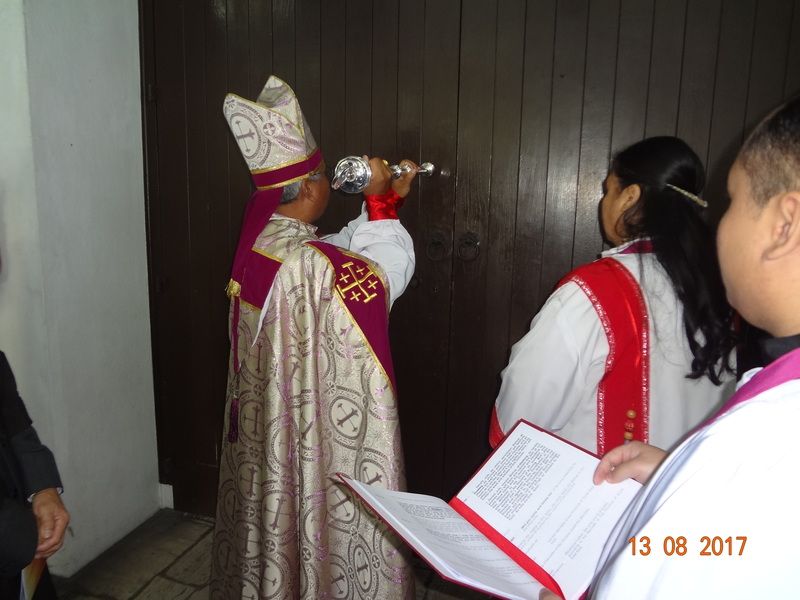 The Bishop-Designate then returned to the entrance to the Chancel Steps and knelt. 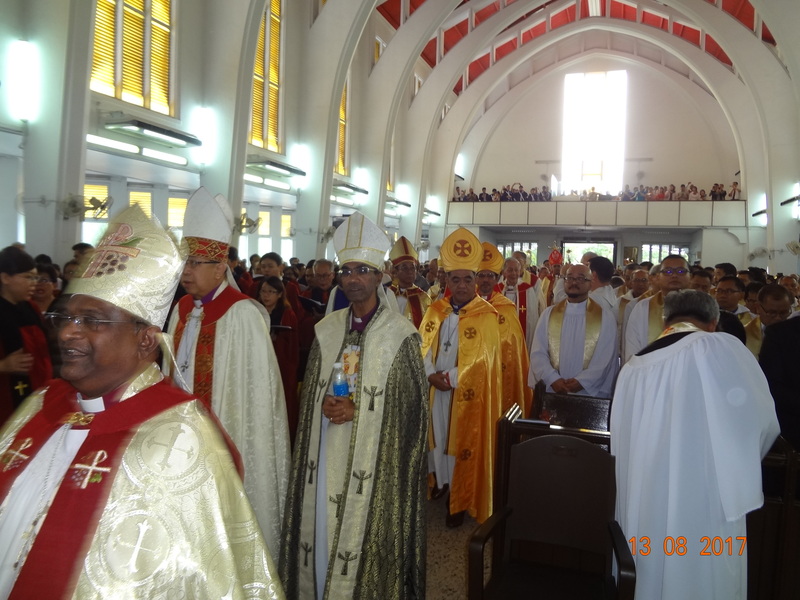 The Archbishop commended the Bishop-Designate to the Prayers of the People and silence was kept. 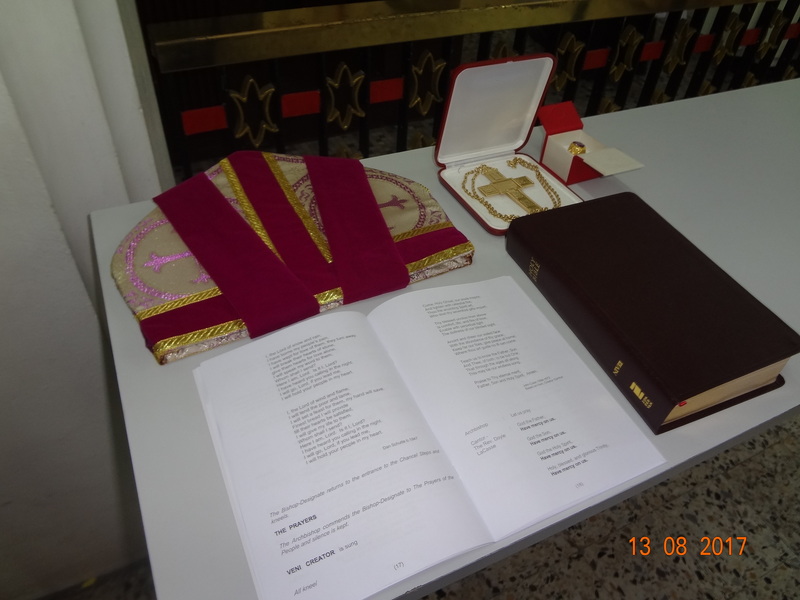 Veni Creator was sung. 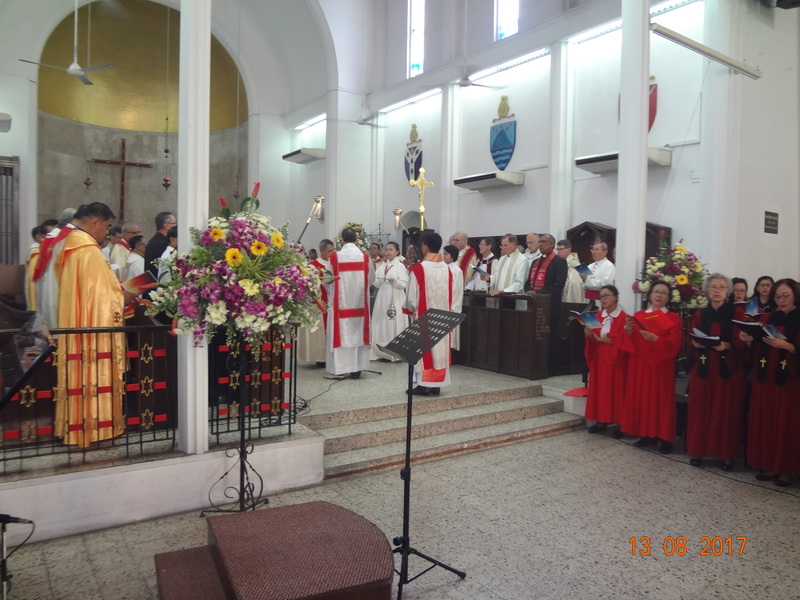 The Archbishop then proceed with the Holy Communion and the Cantor, Rev’d Doyle LeCasse recited the Liturgy. 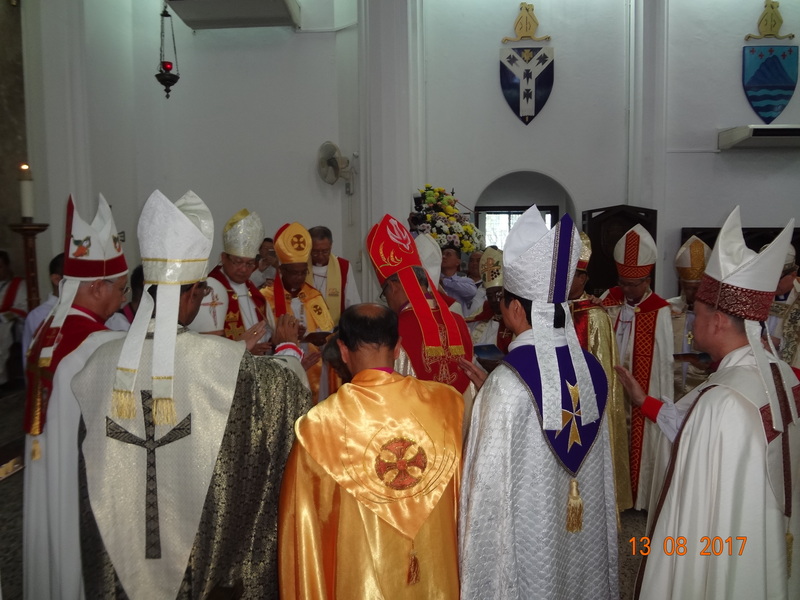 His Grace stood with the other bishops to assist him as the Bishop-Designate knelt before him and the Archbishop prayed for Rev’d Danald and laid their hands on his head to anoint him with the Holy Spirit to guide him in his work as the Bishop of Diocese of Kuching in the Churches of Sarawak and Brunei. 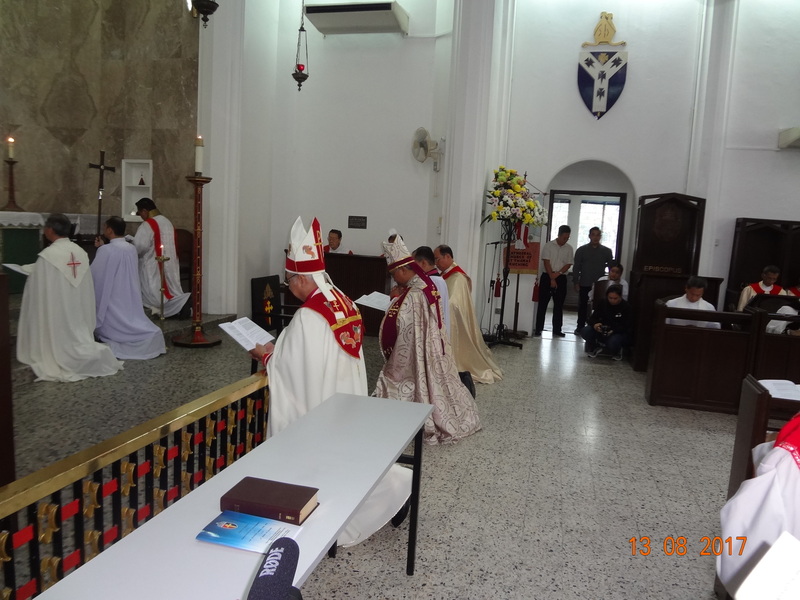 The Archbishop then continued with his prayer. 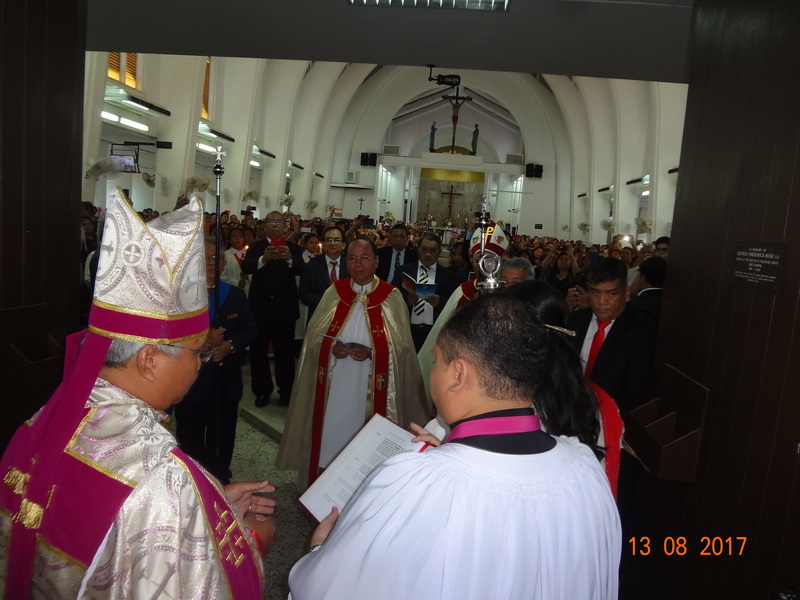 The newly consecrated Bishop stood up and the Archbishop gave the Bible to him. 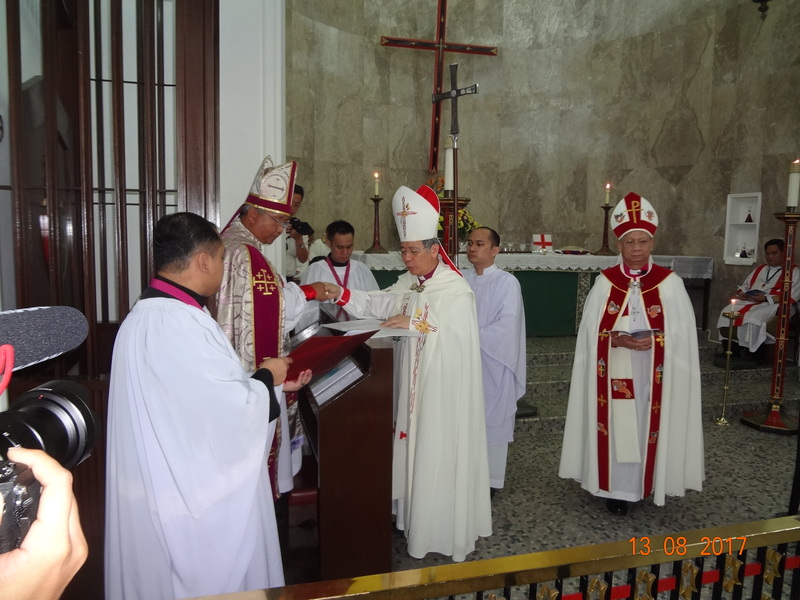 The Vicar-General handed the Episcopal Ring to the Archbishop for his blessing before it was delivered to the consecrated Bishop Danald. 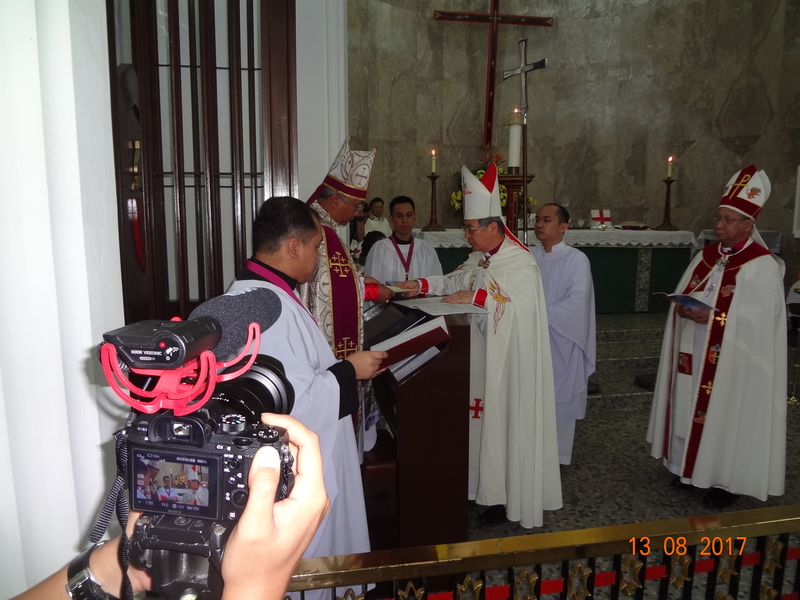 This was followed by the delivery of the Diocesan Pectoral Cross to Bishop Danald and placed on him. 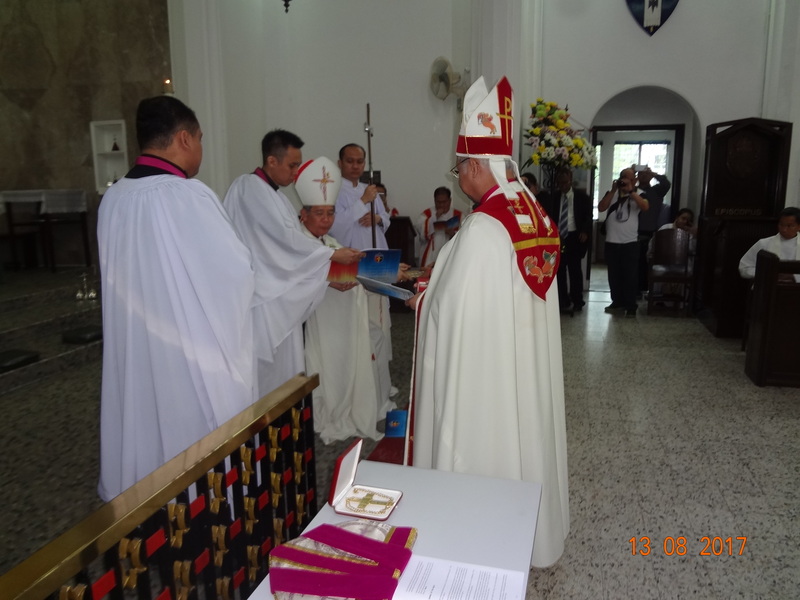 The Vicar-General then handed the Mitre to the Archbishop to be blessed and to place it on the head of Bishop Danald. 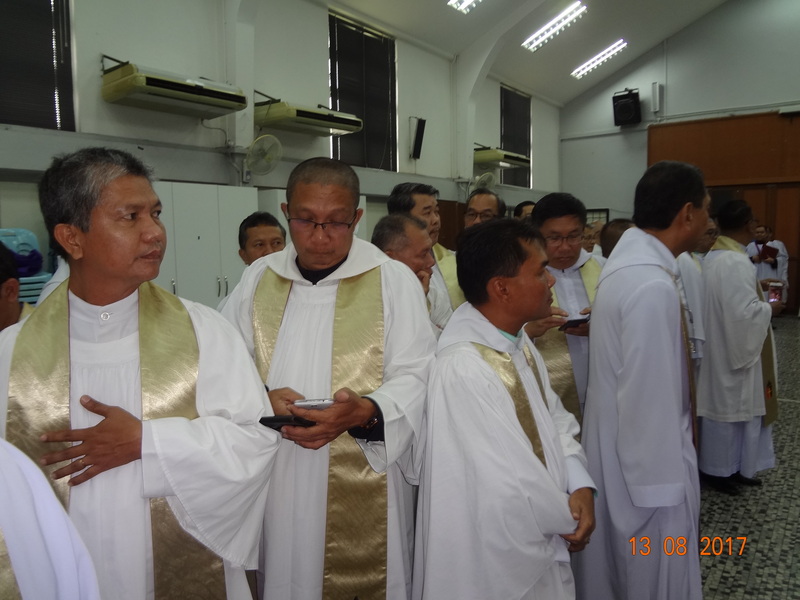 Before the Enthronement, a hymn “We Have a Gospel To Proclaim” was sung. 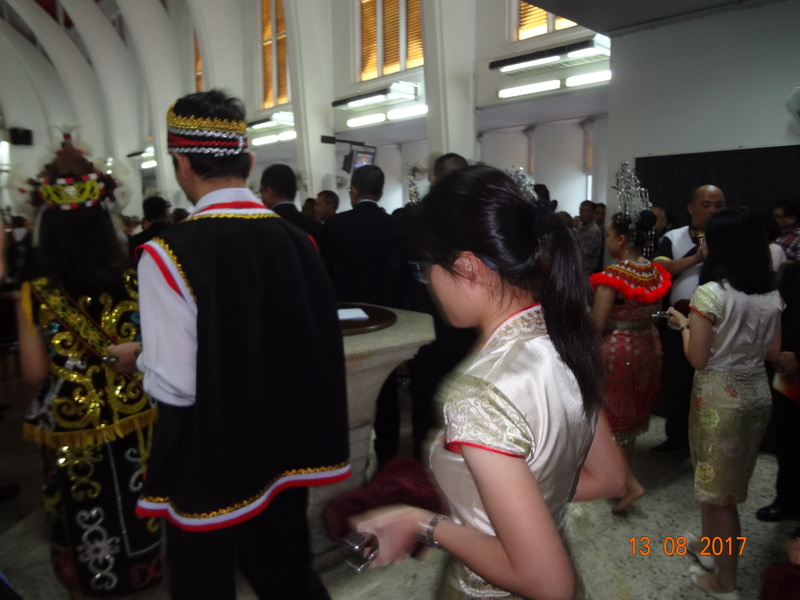 Following the hymn, the Church doors were closed. 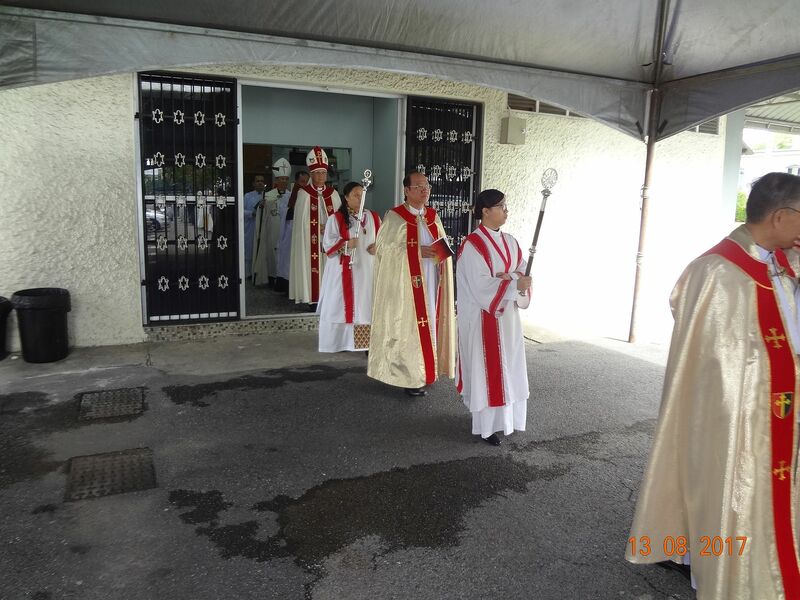 Bishop Danald knocked three times on the door with the Cathedral Mace. 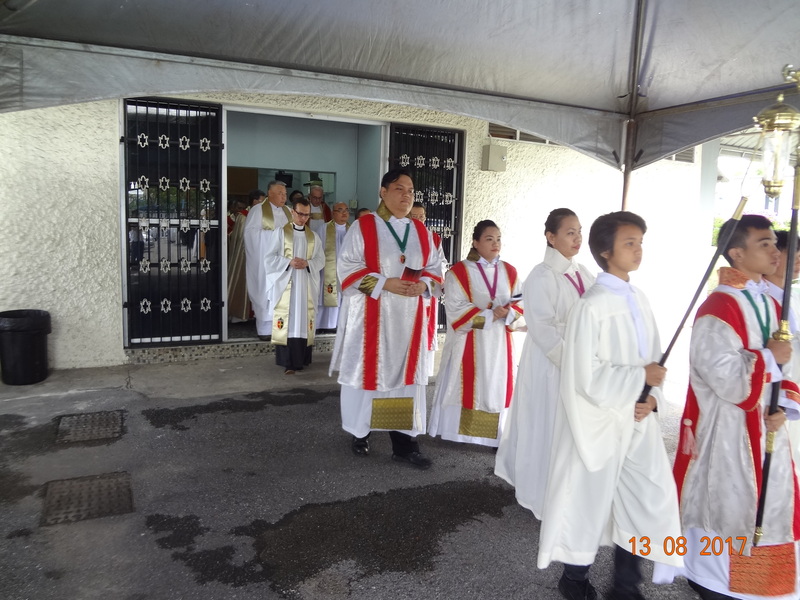 The door was opened by the Dean and the Wardens. 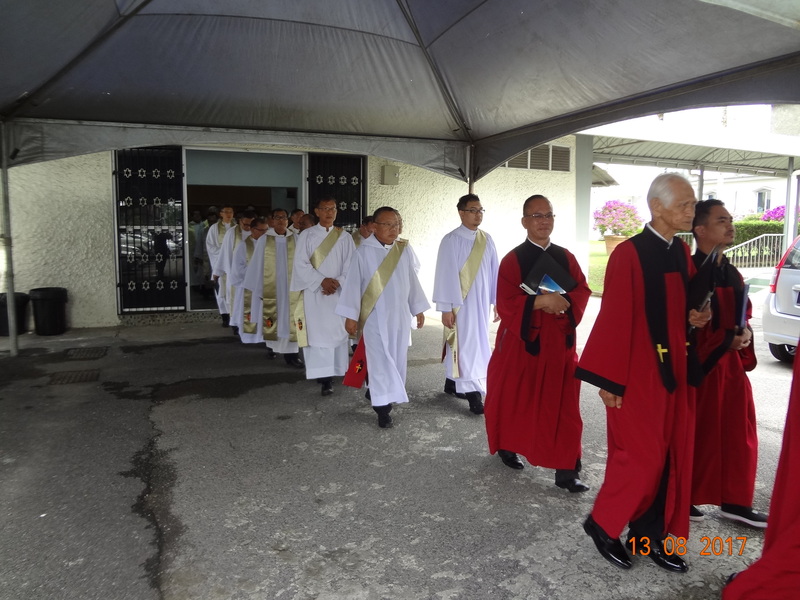 A fanfare of Trumpets was sounded. 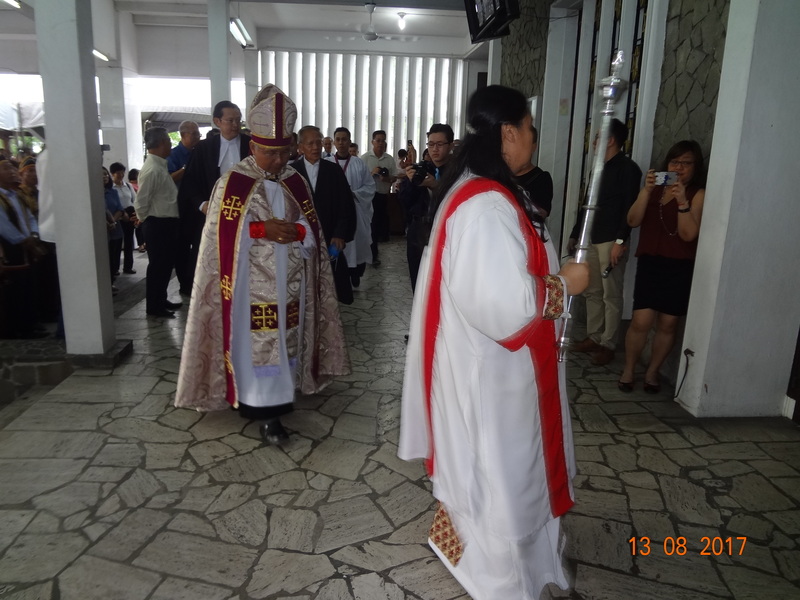 Bishop Danald then moved to the Chancel steps with the Dean, the Registrar, the Chancellor and the Wardens. 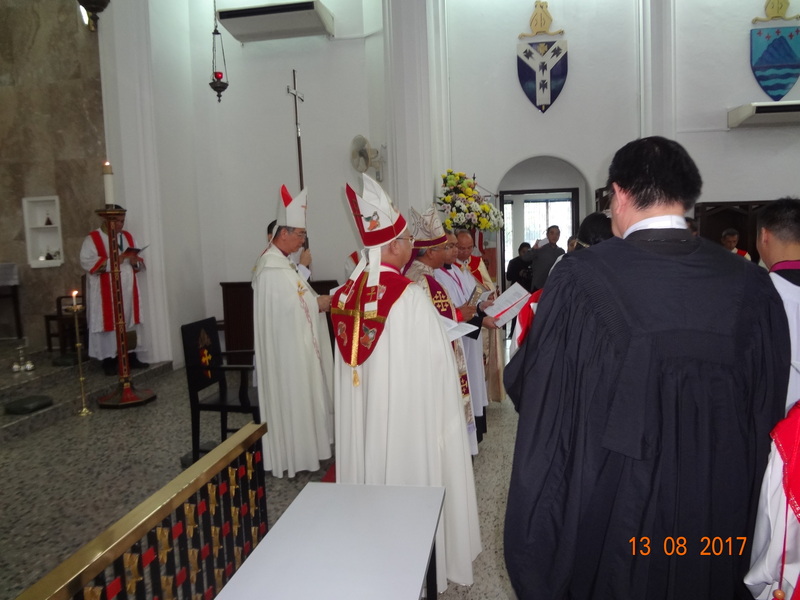 Following the singing of the hymn “Will you came and follow me”, the Dean led the Bishop to the Chancel, where he joined the Canons of the Cathedral. 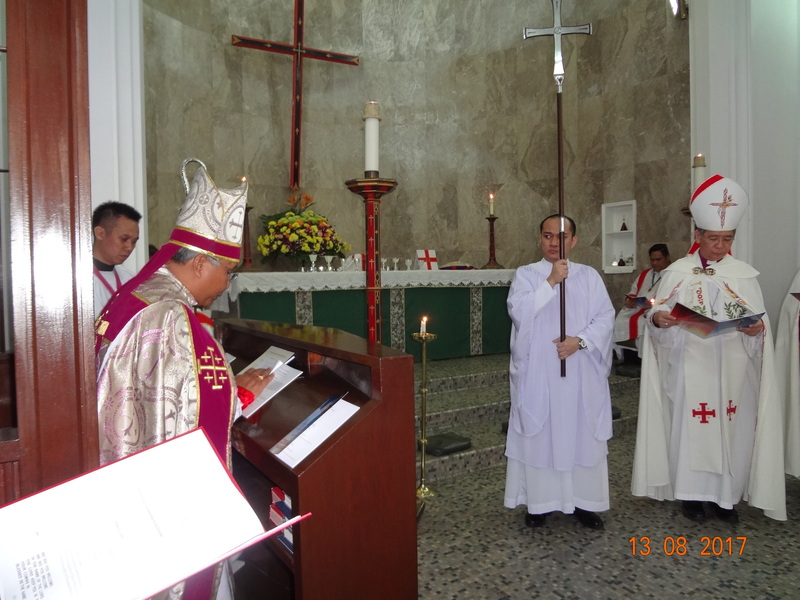 The Chancellor of the Diocese read the Mandate. 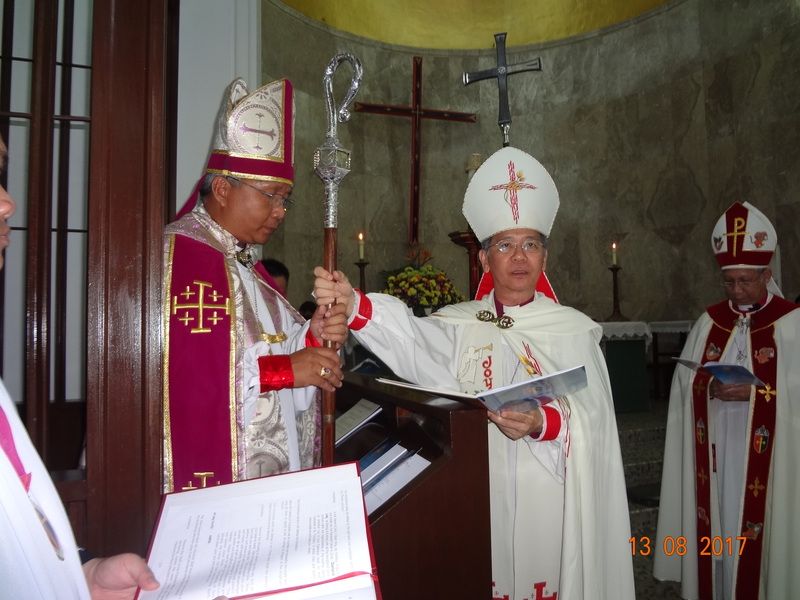 The Archbishop took Bishop Danald right hand and led him to the Throne and handed him the Investiture. 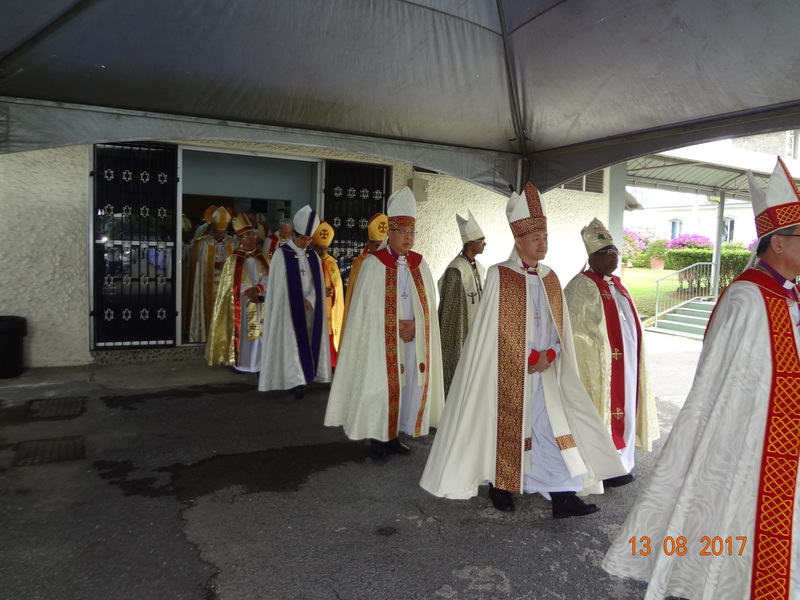 The Fanfare of Trumpets sounded again and the Cathedral bells rang 39 times to signify the 39 Articles of Religion of the Anglican Church. 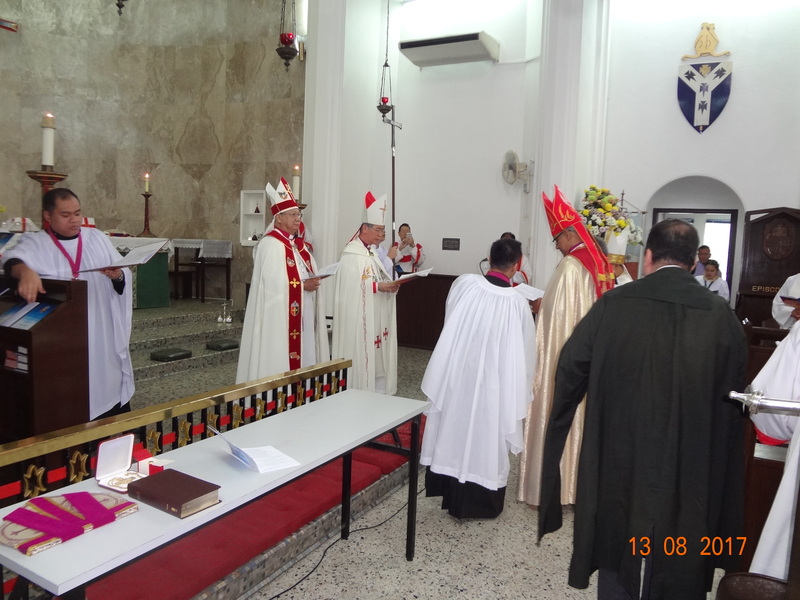 The Vicar-General took the Pastoral Staff from the Altar and handed it to the Archbishop who then gave it into the hands of Bishop Danald. 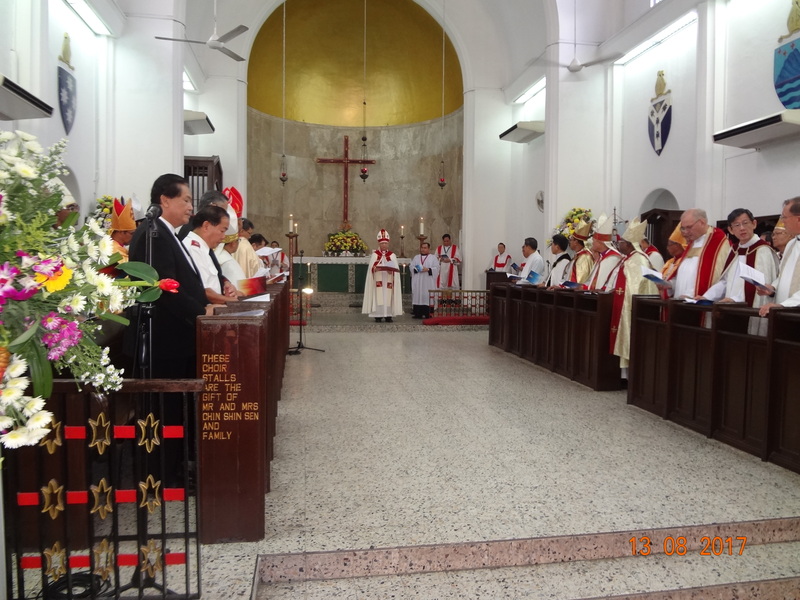 Seated on the Throne, the Bishop addressed the Congregation. 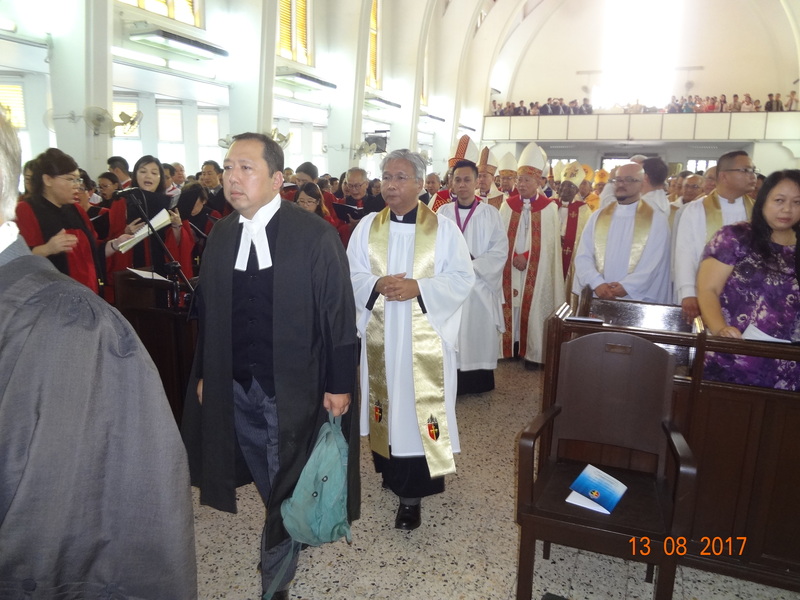 The Archbishop with the Cathedral Chapter then presented Bishop Danald to the Diocese with the bells ringing and the Congregation applauding. 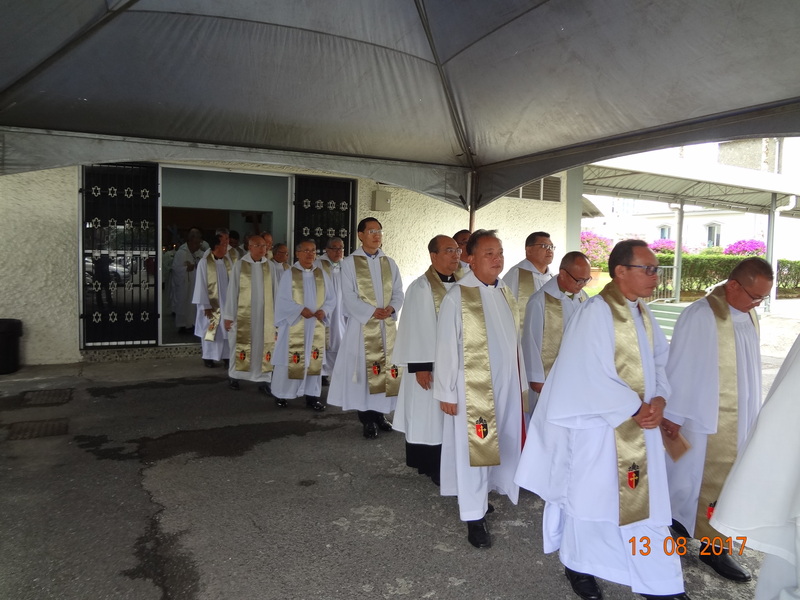 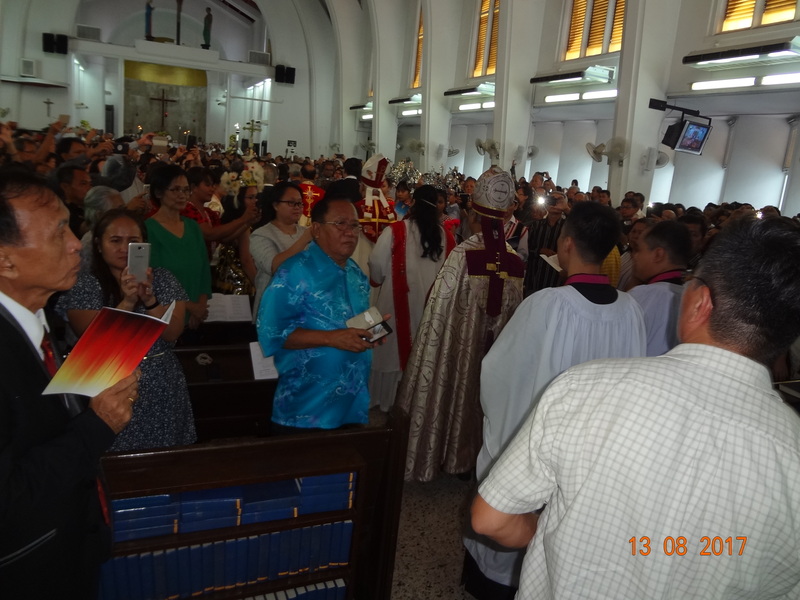 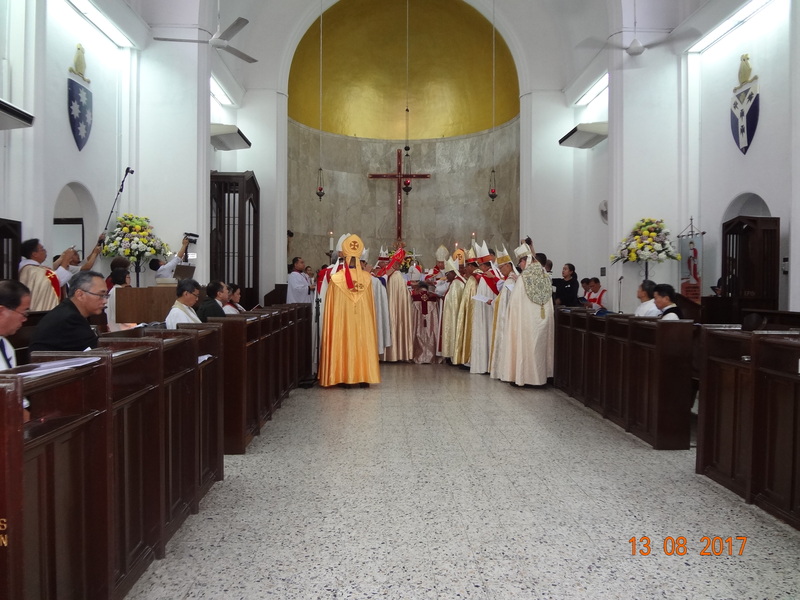 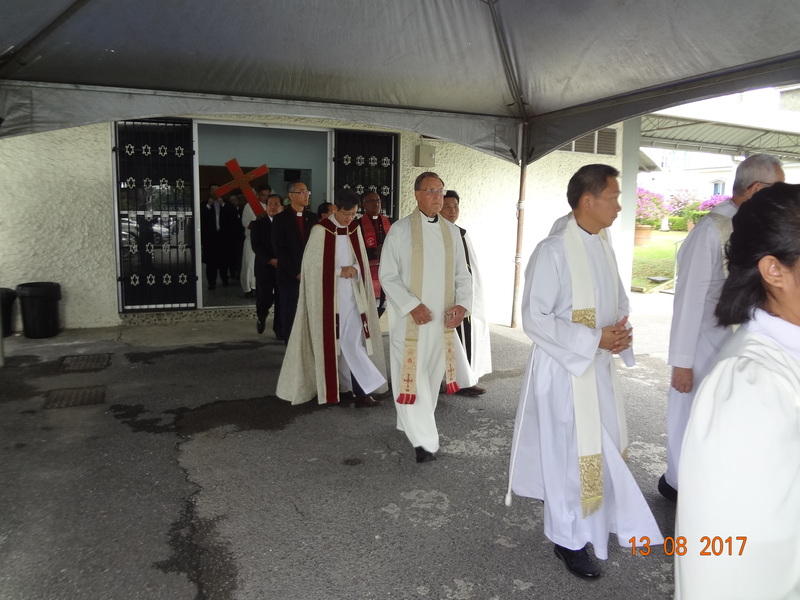 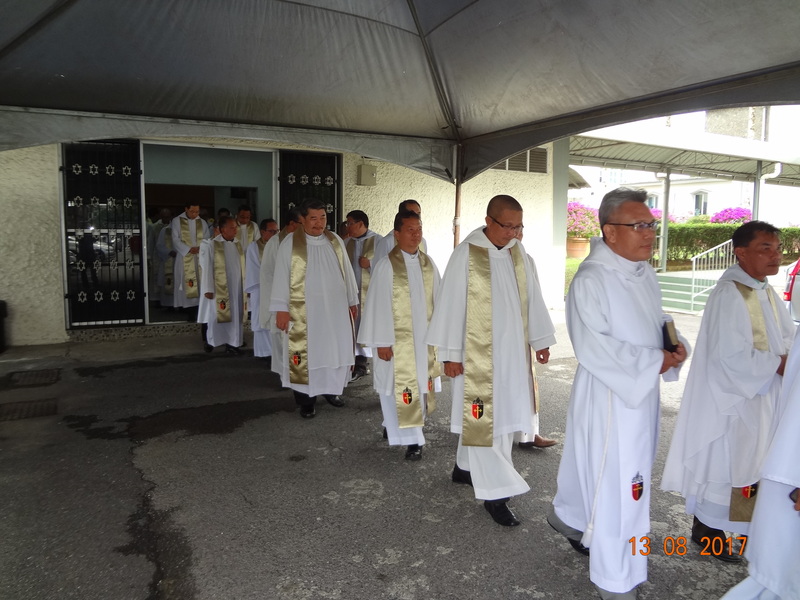 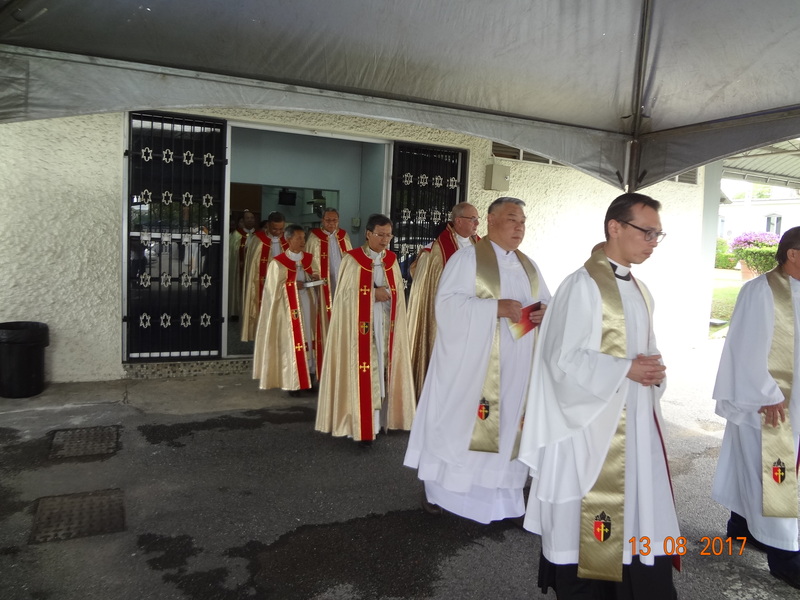 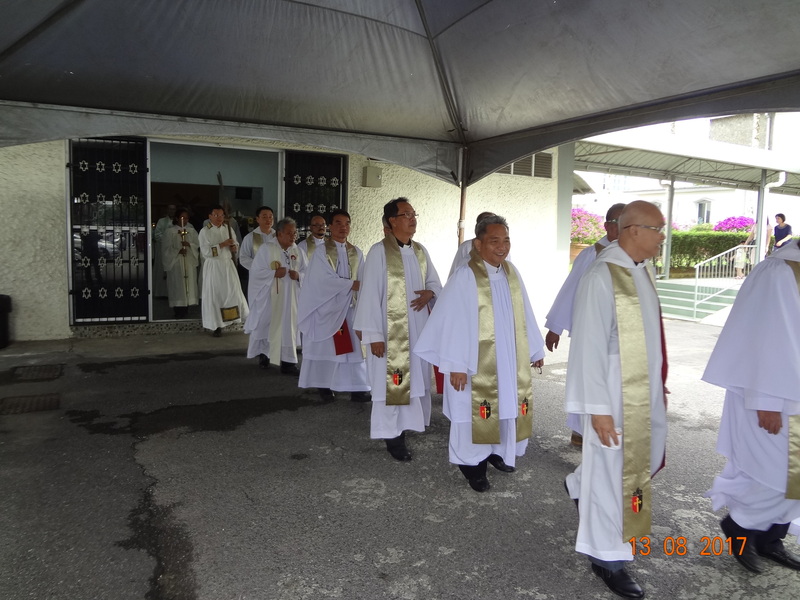 The Archbishop resumed the Communion Service and Bishop Danald participated in the Holy Communion as his first duty of the Bishop of Diocese of Kuching.